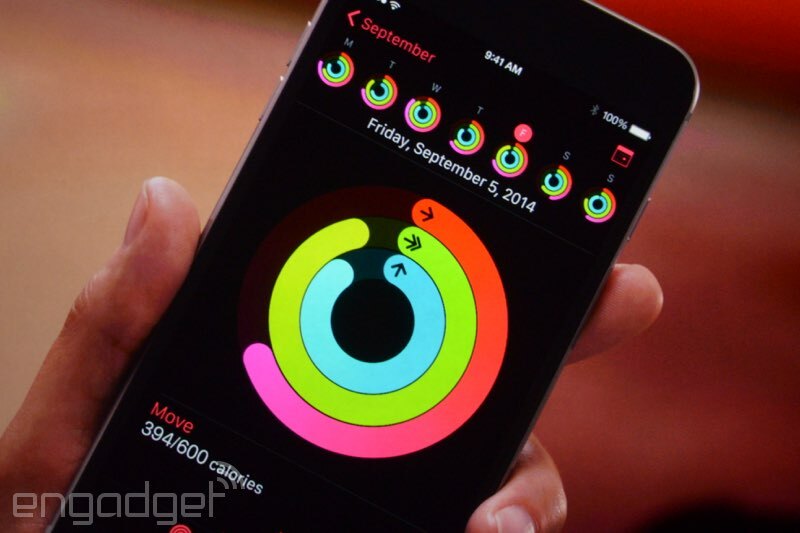 iP3: Apple's iPhone and wearables event liveblog! 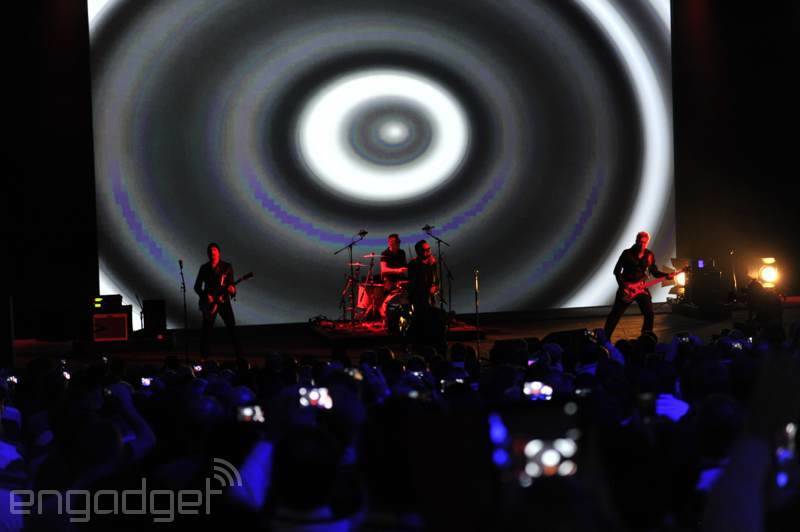 As U2 performs, we may be a bit silent. 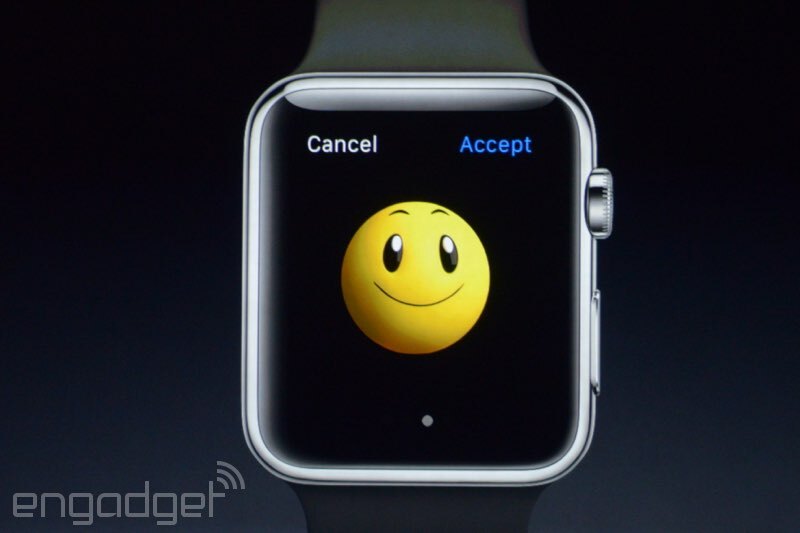 We're guessing this is going to be the end of the keynote; we're going to stick around just in case. And they're going to perform today! 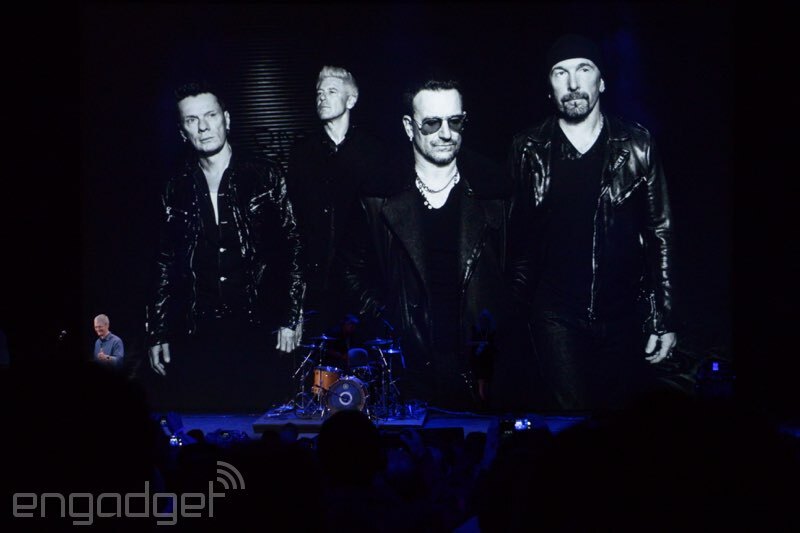 And it looks like U2 is in the house! Wait, looks like they're bringing equipment on stage now. Ooh, there's another "one more thing." 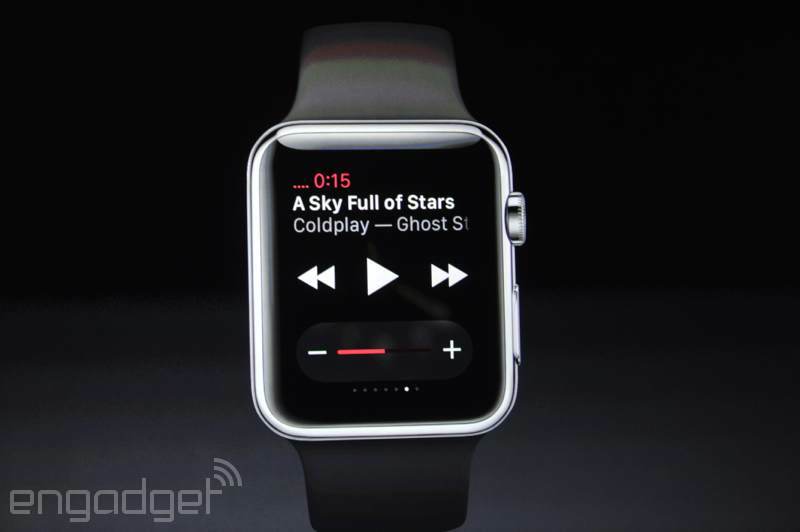 Ah, it's about Apple's love for music. 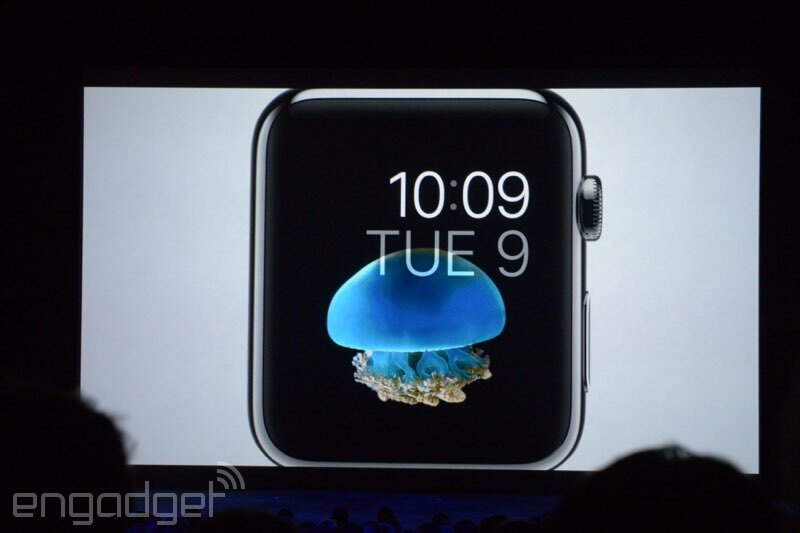 Watch "will redefine what people will expect from a watch." Sounds like Tim is wrapping up, because he's now in summary mode. 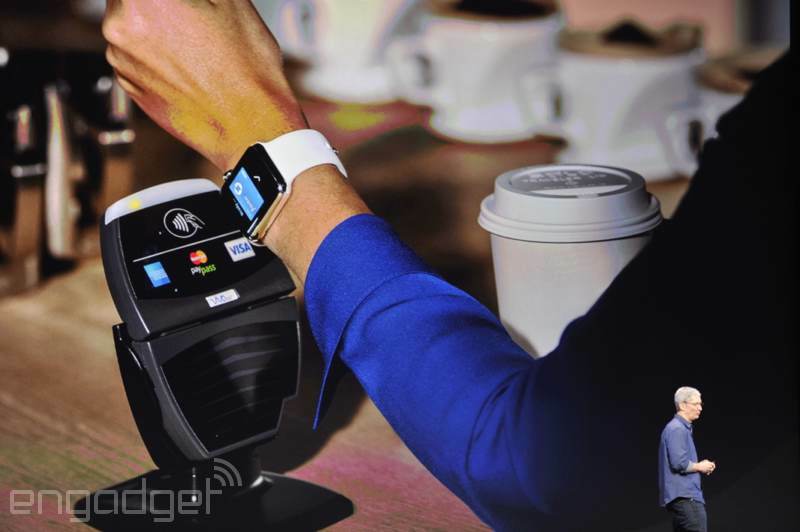 Looks like NFC is built-in to the Watch to make that possible. 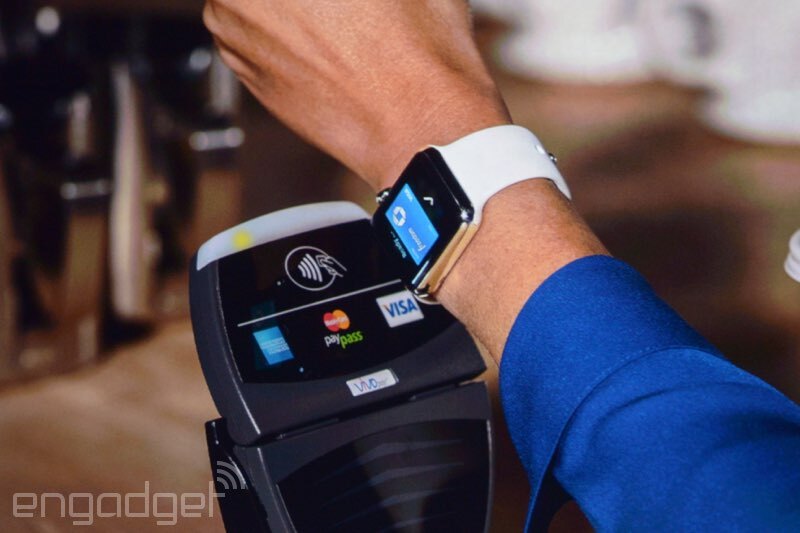 Apple Pay will work with Apple Watch! 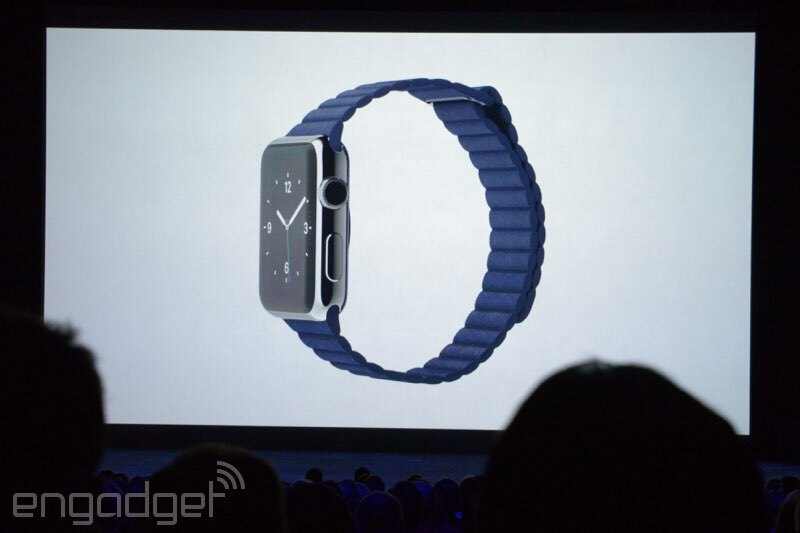 And it's going to be available in early 2015, "and I think it'll be worth the wait." It works with iPhone 6 and 6 Plus, but it'll work with the 5s, 5c and 5. 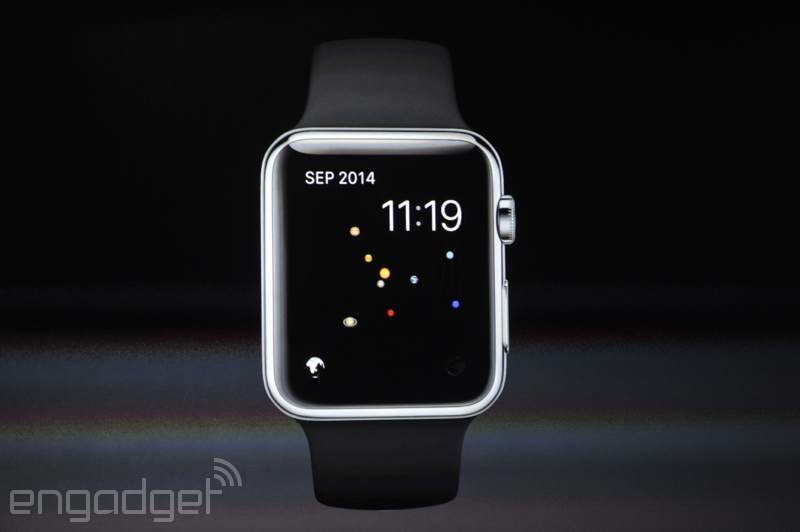 Apple Watch requires iPhone, because it's been designed to work together, like Handoff on iOS 8. 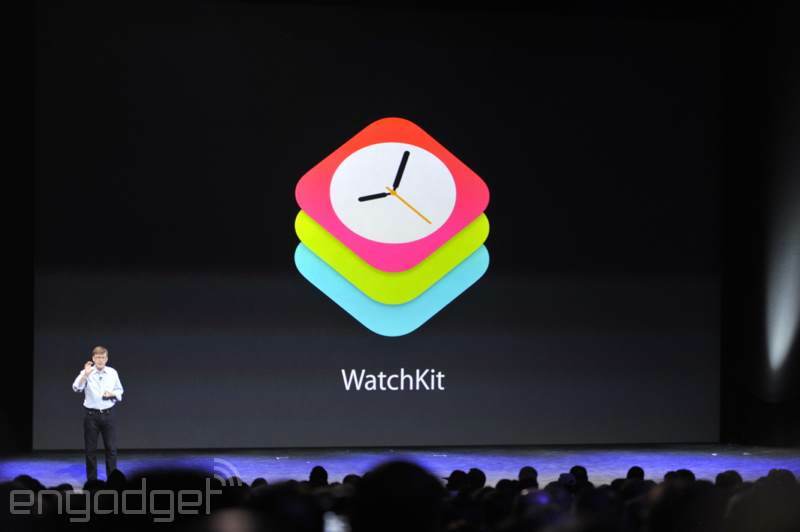 "The list of features is a mile long, and I'm certain that list will get even longer as developers get their hands on the WatchKit." "It is so much more that we don't have time to cover today." 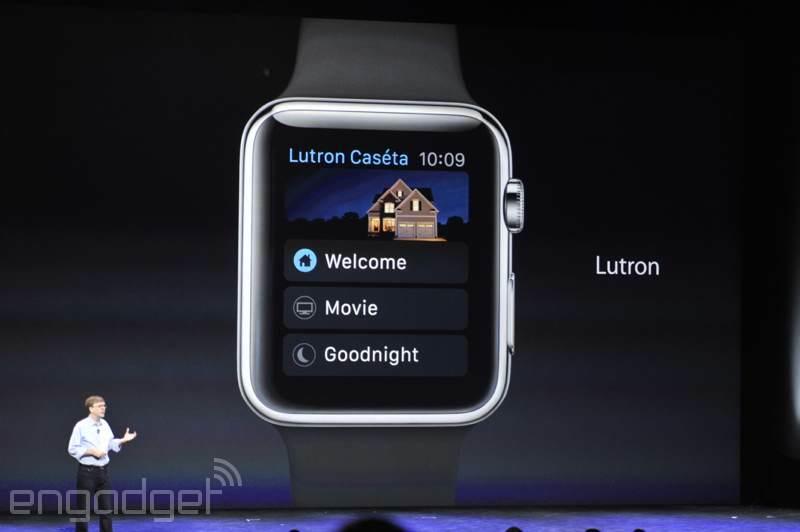 "Apple Watch required some deep innovation." Over time, the Watch gets to know you; it will bring you reminders to help keep you motivated. You can track calories burned, the activity you've done (anything at the level of a brisk walk or above); there's something that shows your sedentary time and how long you've been standing. 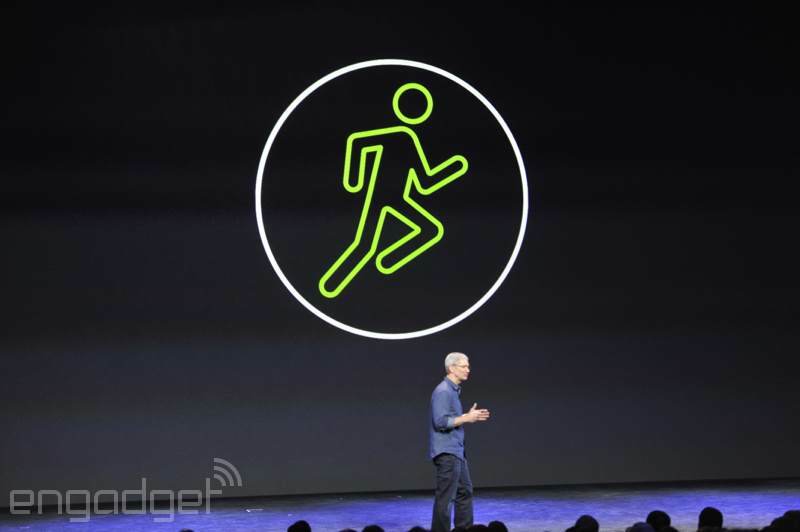 It can track a wide variety of activities; using an accelerometer and a custom heart rate monitor; it also uses GPS and WiFi in your phone to track how far you've moved. There's a fitness app, which monitors activity and movement; there's also a workout app, which lets you set goals for specific types of workouts, like cycling or running. "Being more active is one of the best things you can do to improve your health. 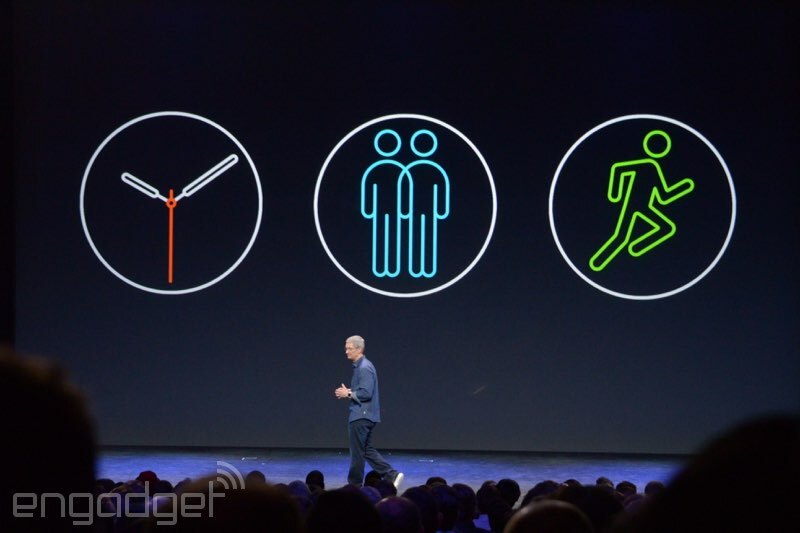 Apple Watch motivates people to be more active." 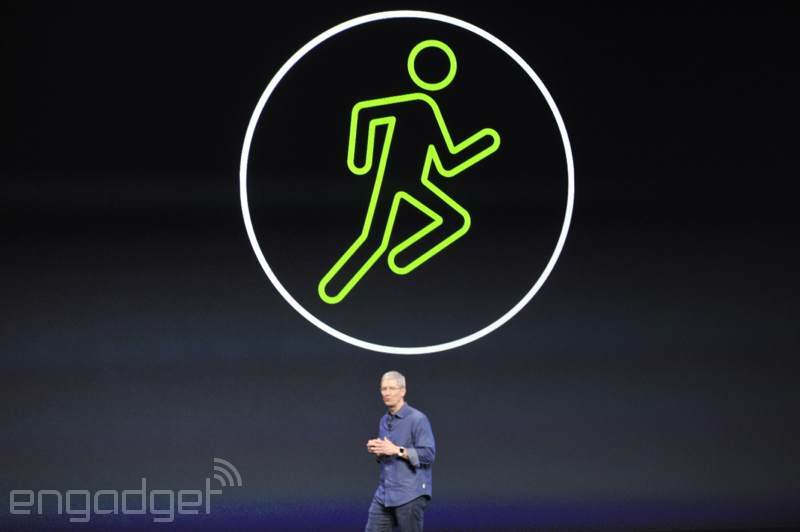 Tim's back on stage to talk health and fitness. "It's a very important area for me, and important for Apple." 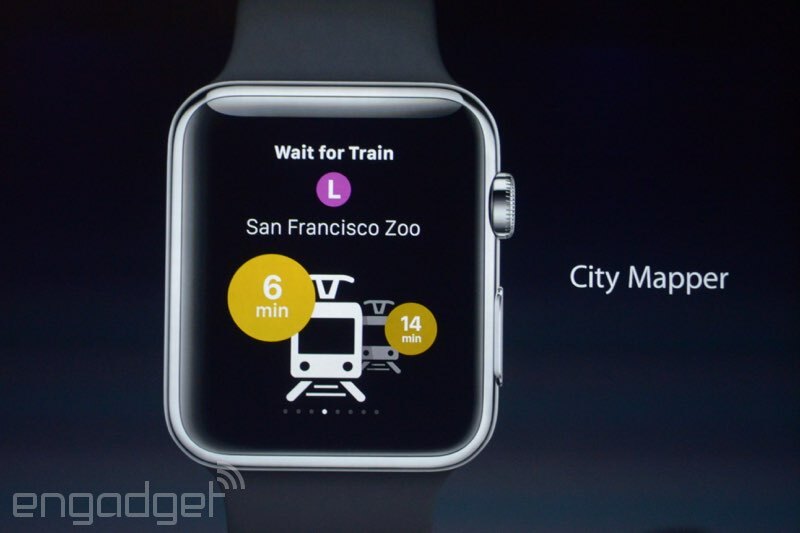 City Mapper gives you transit directions. Pinterest reminds you when you're near a pin; BMW lets you see the charge level of your car, and gives you a map of where your car is, and gets you directions back to the car; Honeywell, Lutron, Nike and so on. 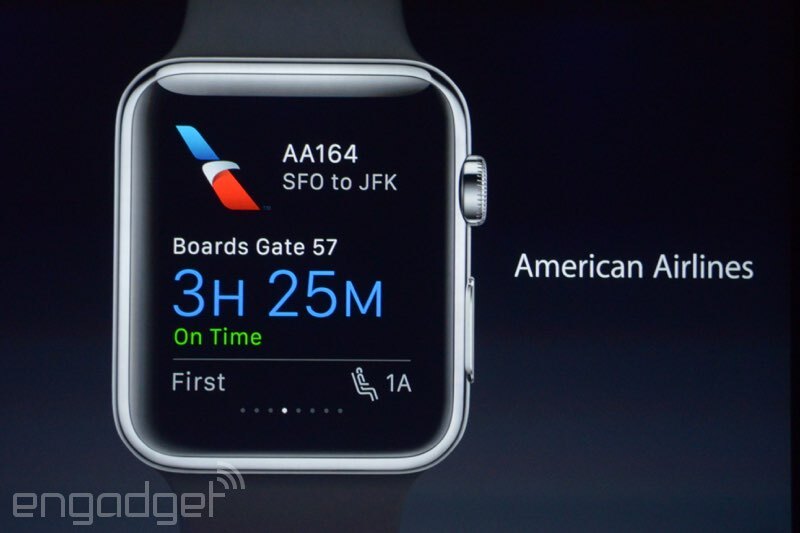 American Airlines has an app as well; same with Starwood Hotels. 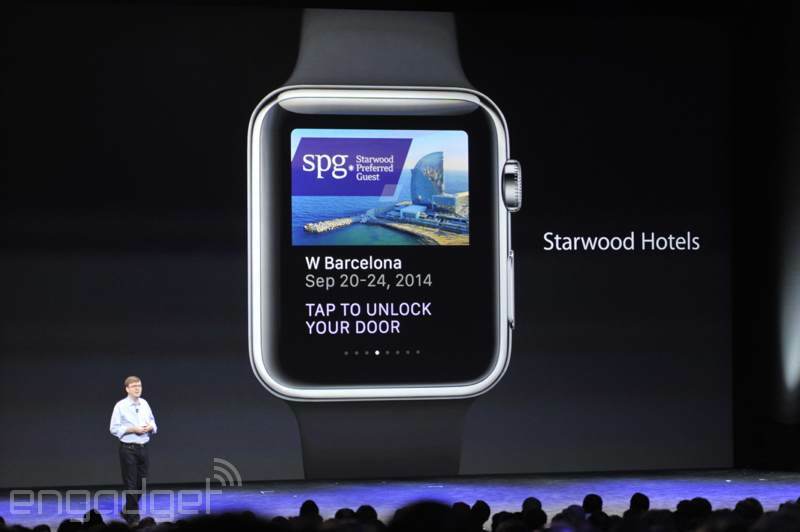 You can unlock your hotel room door by waving your watch in front of it! 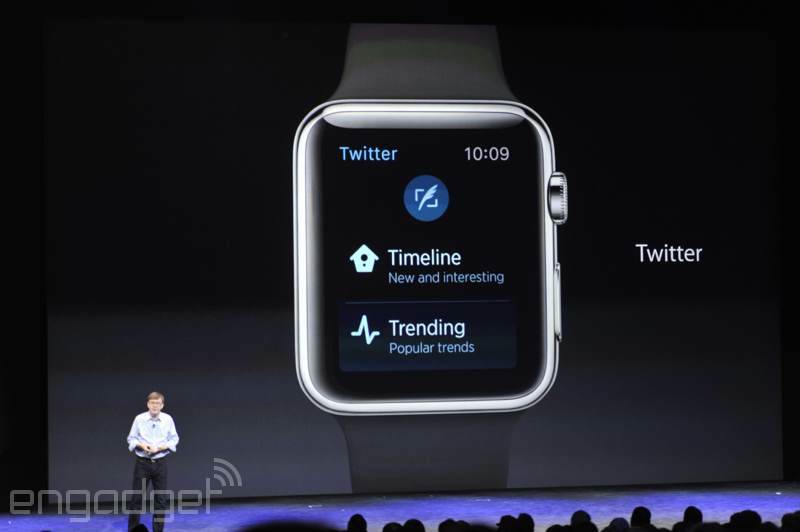 Or you can go into the Twitter app and look at your timeline, trending tweets or create your own tweet. 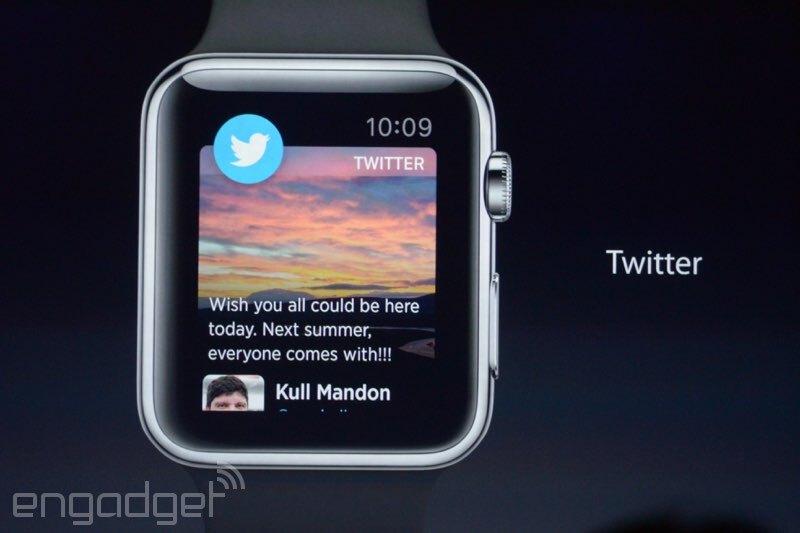 We're seeing a Twitter app that shows custom notifications. 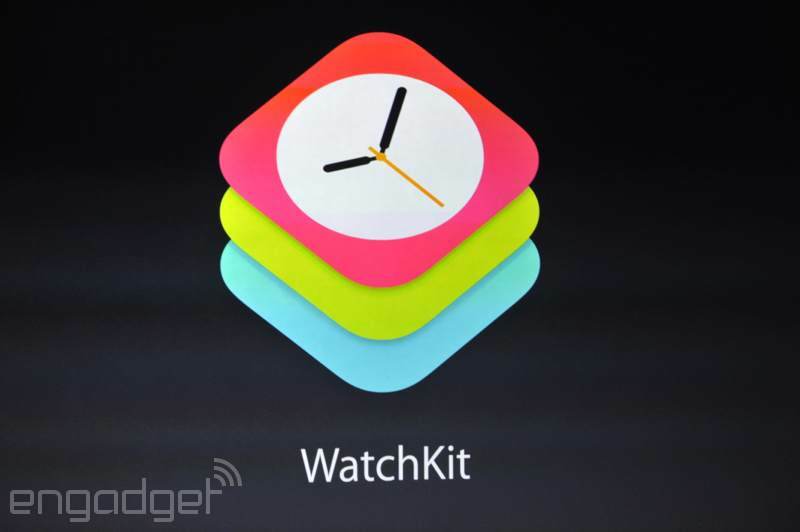 Third-party support is enabled through something called WatchKit. This helps integrate those apps into the Glances screen as well as the home screen. Now on to third-party developer support. 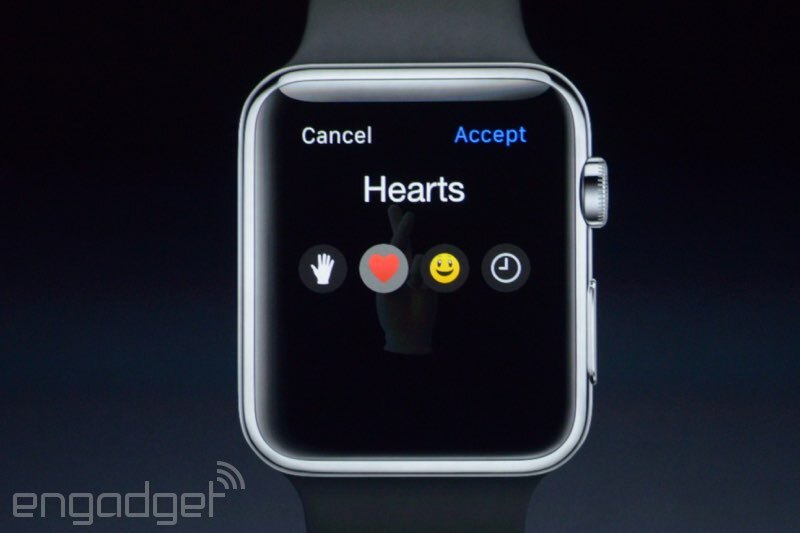 You can also send those contacts your heartbeat in real time. 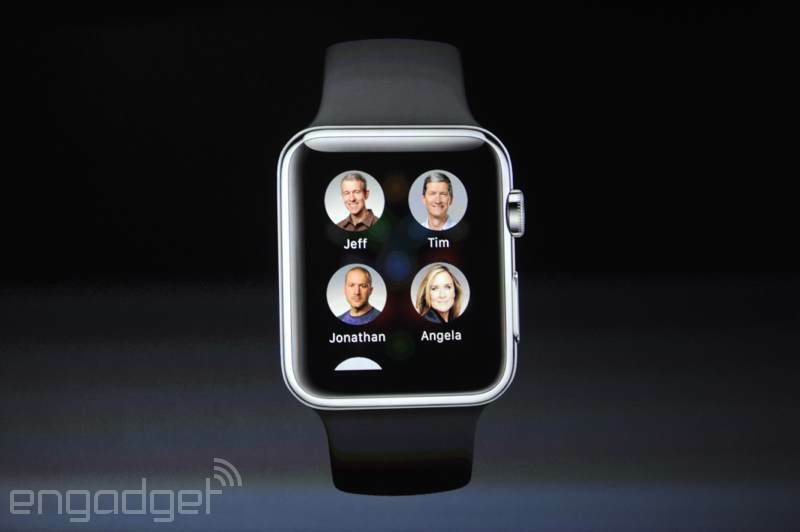 The bottom button is called Digital Touch, which brings up a list of contacts. 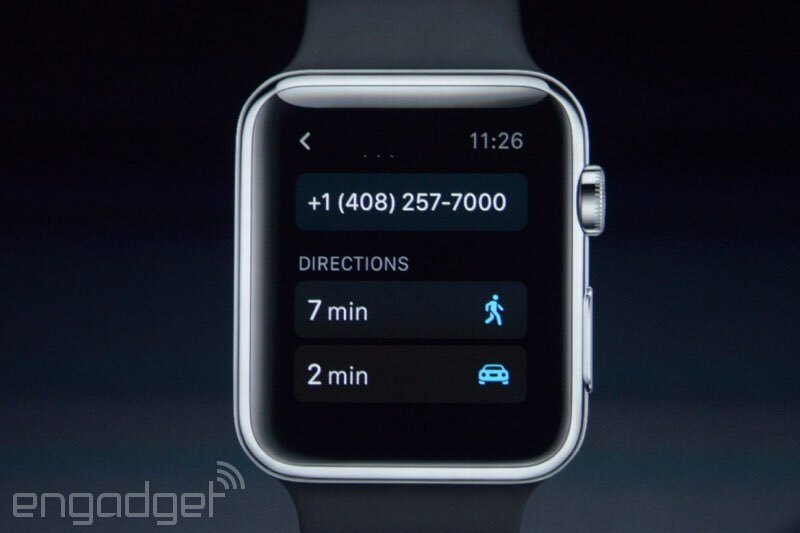 When you go into that contact, you can tap or draw shapes, which gets sent to that contact. The usual info is there, such as walking/driving directions, hours and a phone number for you to call. 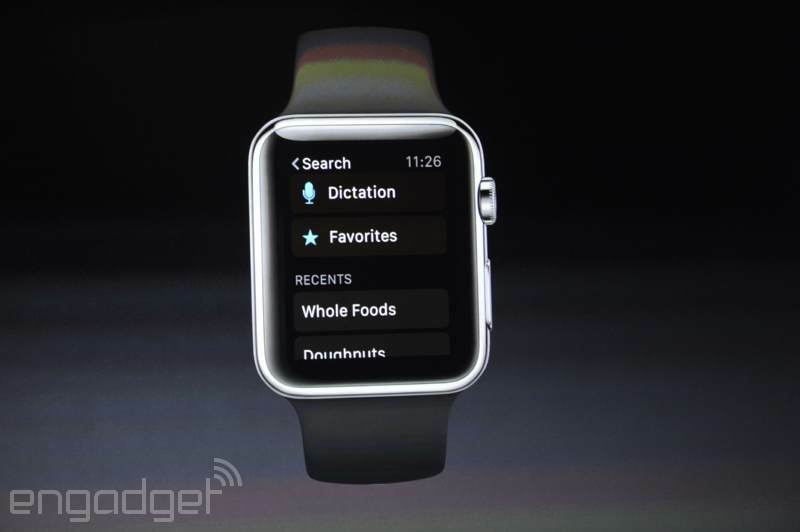 You can do searches through voice. 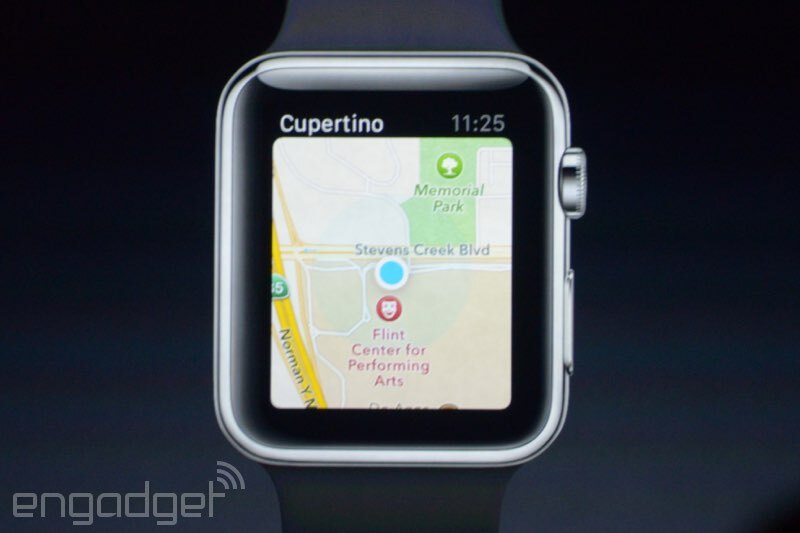 Maps are also here. Swipe to pan around, and zoom out with the crown. 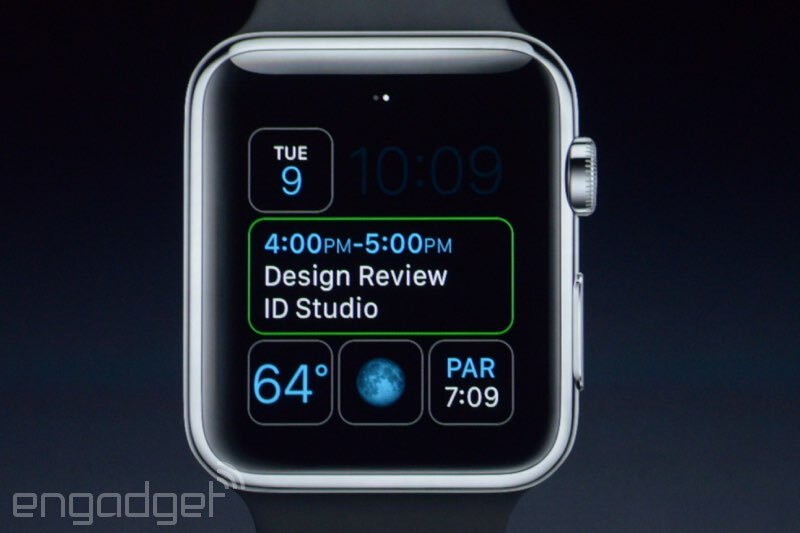 The demo shows a very responsive map. 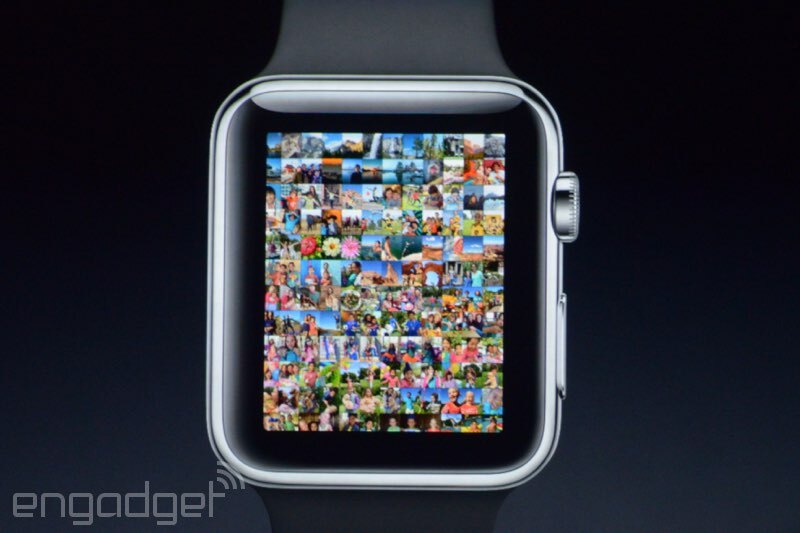 There's a photos app as well. Use the crown to zoom in on photos or use your finger to pan around and tap. 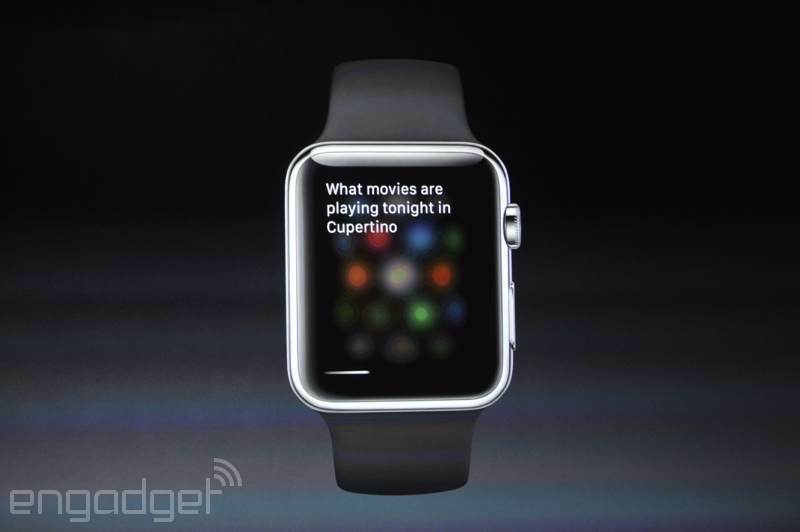 Siri is built into Watch, so you can press the digital crown and ask what movies are playing tonight, and she'll respond with a list of movies, which you can scroll with the crown or use the touchscreen and swipe through. 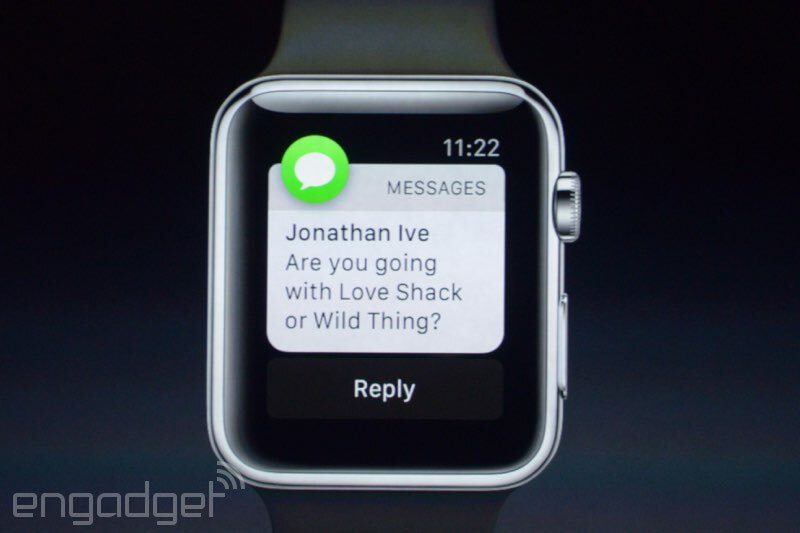 With messages, the watch can generate potential replies -- when Jony Ive asks him if he's going with "Wild Thing" or "Love Shack," the reply options show "Love Shack," "Wild Thing" or "neither." So in a calendar invite, you can accept, decline and so on. 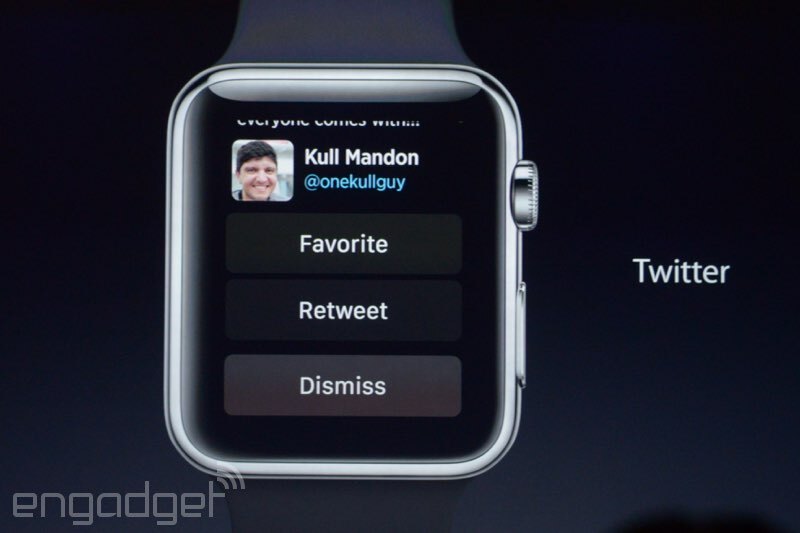 The notifications are also actionable. 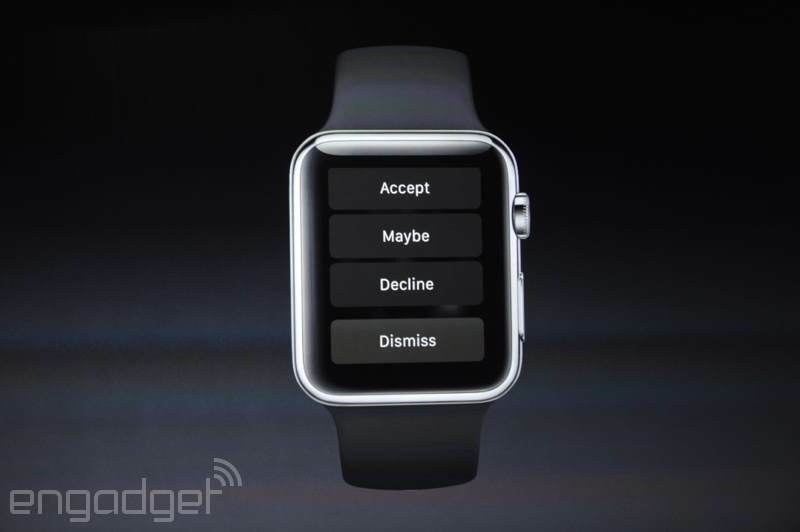 There are notifications, and you can choose which notifications show up on your wrist. Now we're listening to Coldplay. Because Apple. 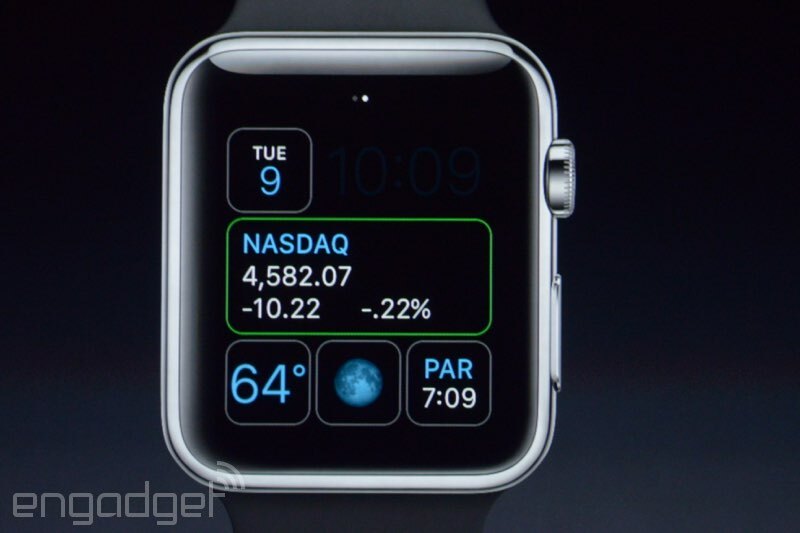 There's a feature called Glances, in which you swipe up from the bottom and you can see info like meetings, weather, stocks, world time or music player. You can also zoom out and look at the solar system and see the real-time position of all the planets. 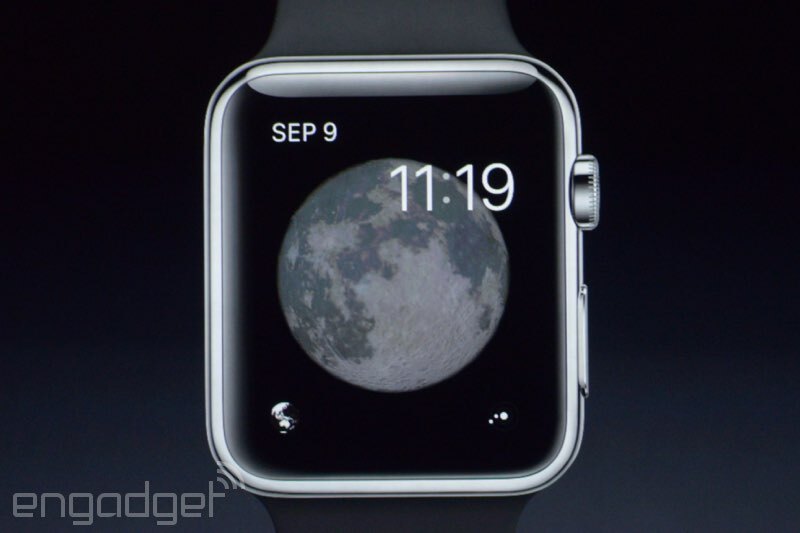 "It's the correct moon phase, and it's a full moon right now." He's showing off the Astronomy face, which shows the Earth. Tap on the bottom left and it'll fly you to the moon. 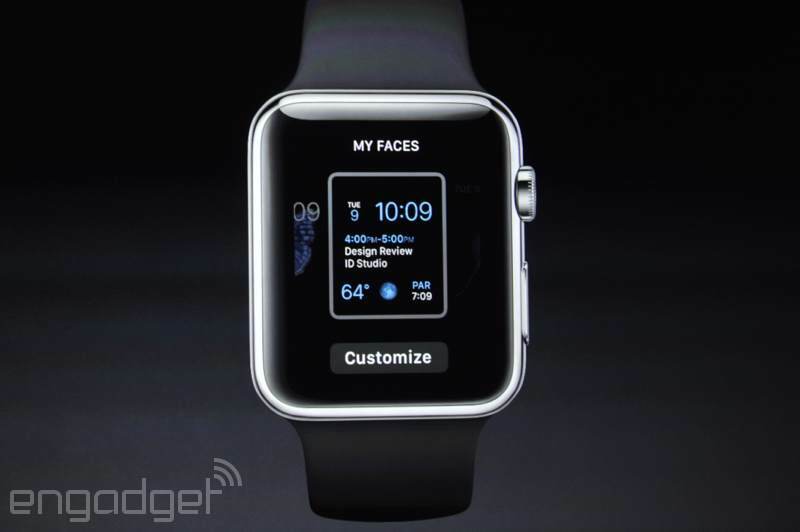 The watchface is customizable; to customize it, you touch the display and swipe through the different options. You can change the color and the functionality; there are green outlines for each section that show which particular section you're changing. 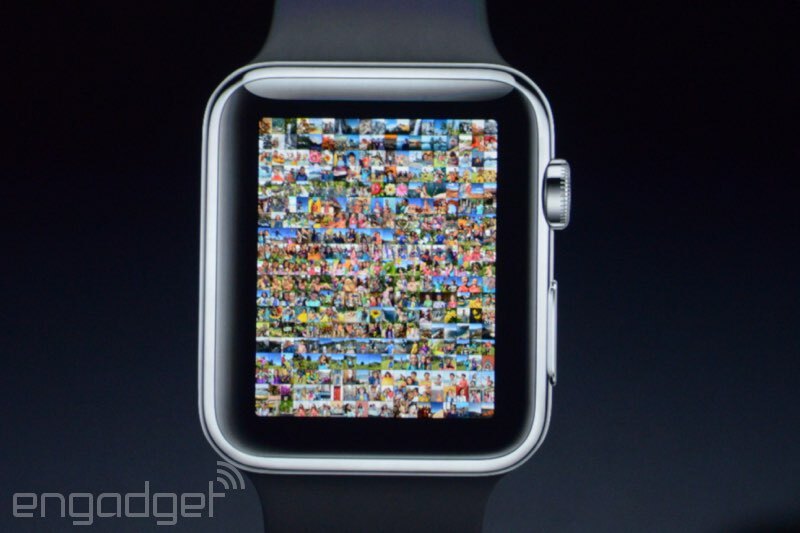 You can zoom in and out of different "neighborhoods" of apps. 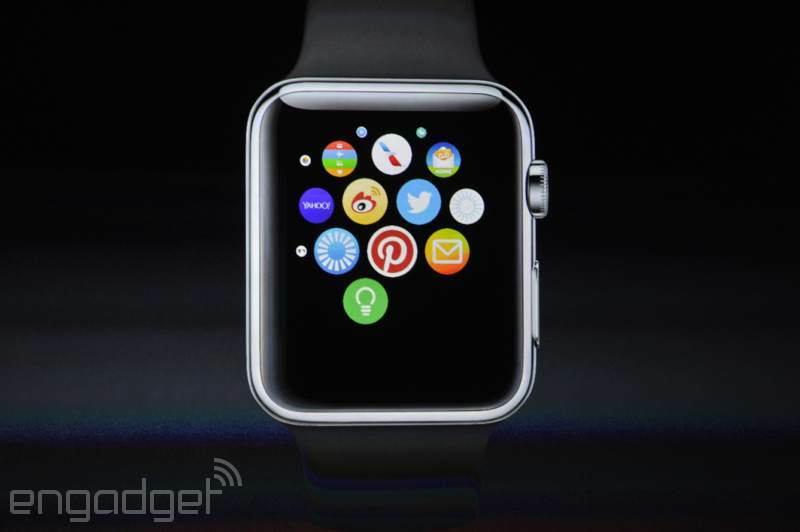 In the UI, the clock is the center of the universe; you can swipe around to get an overview of all your apps. 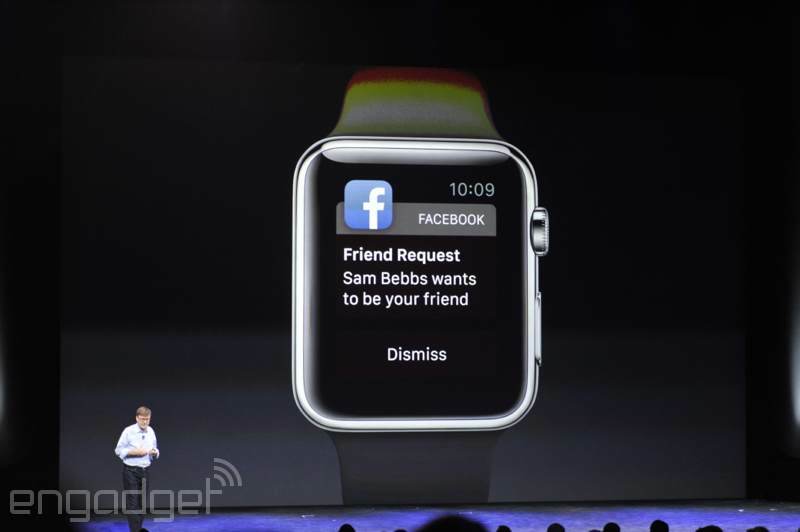 The iPhone is required with Apple Watch. 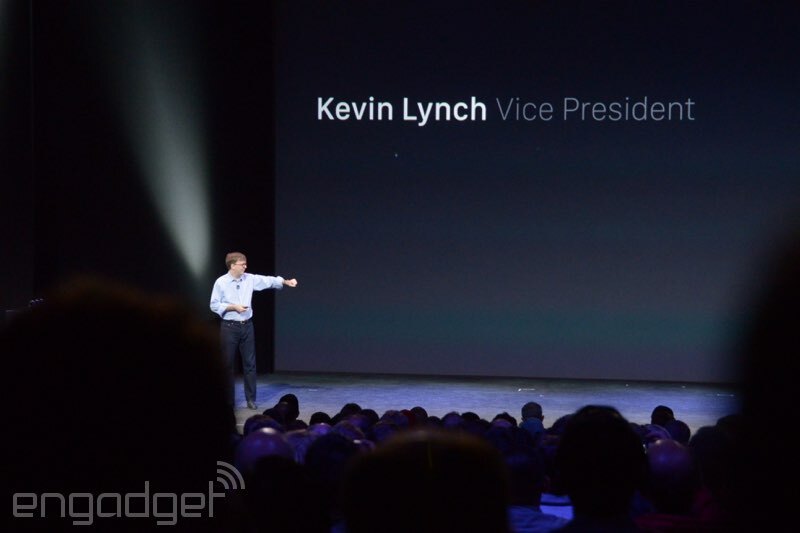 Kevin Lynch, VP, is coming on stage to give the very first demo. 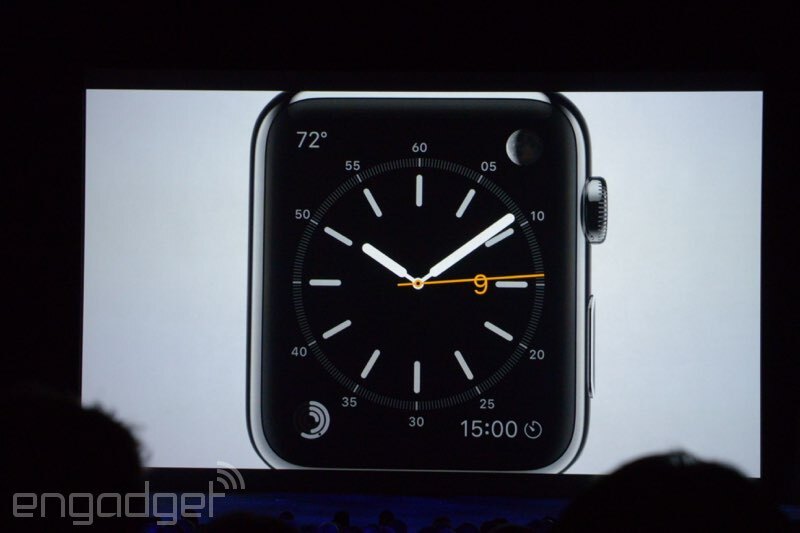 "We've been working on the watch for a long time. 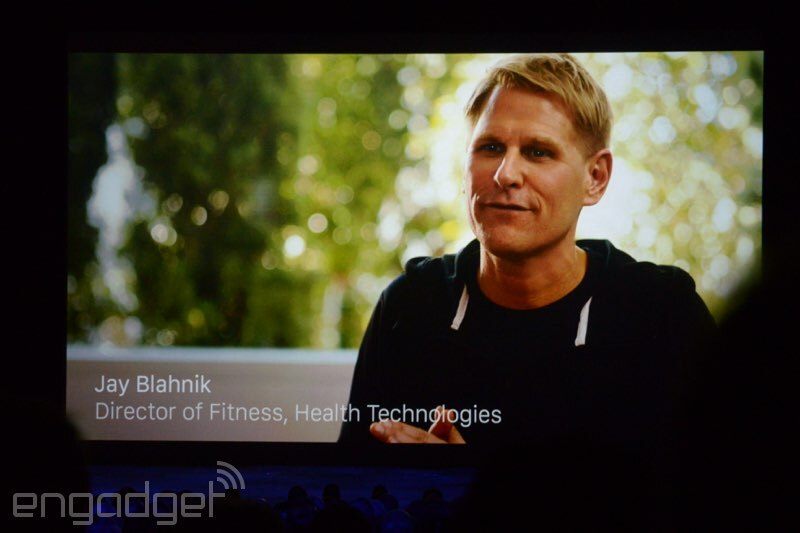 We've assembled an amazing team to do so, that covers every discipline at Apple." He's trying to talk, but the audience isn't having any of that -- they're too busy cheering. Video's done, and Tim is back. 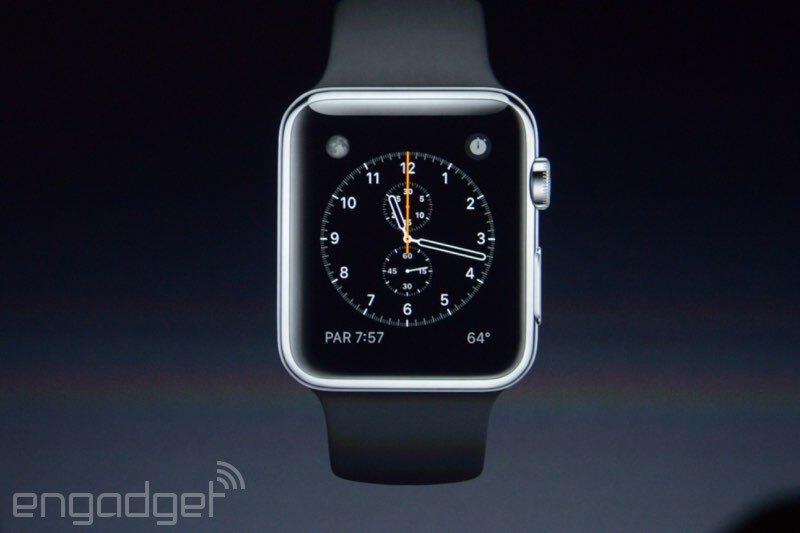 There's also a smaller-sized watch, just in case the main ones are too big. The first is made of stainless steel; the Sport comes with a aluminum casing; and the Apple Watch Edition is made of 18k gold. 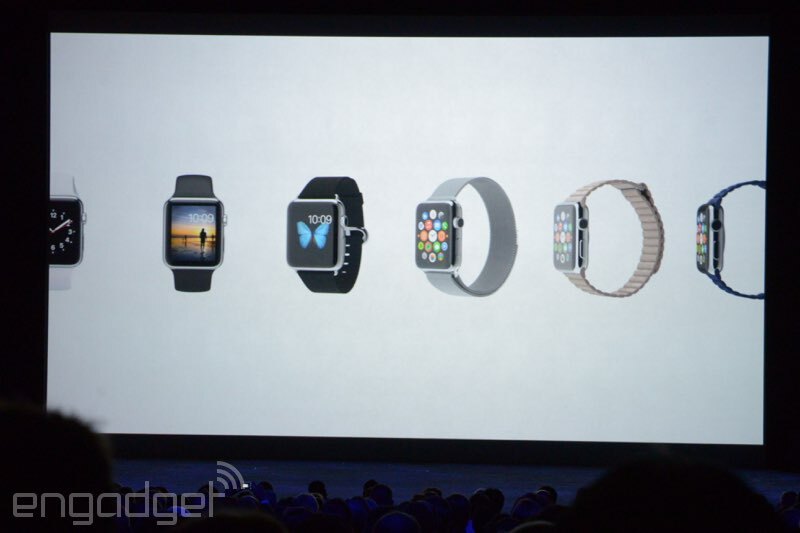 There are three watch collections. 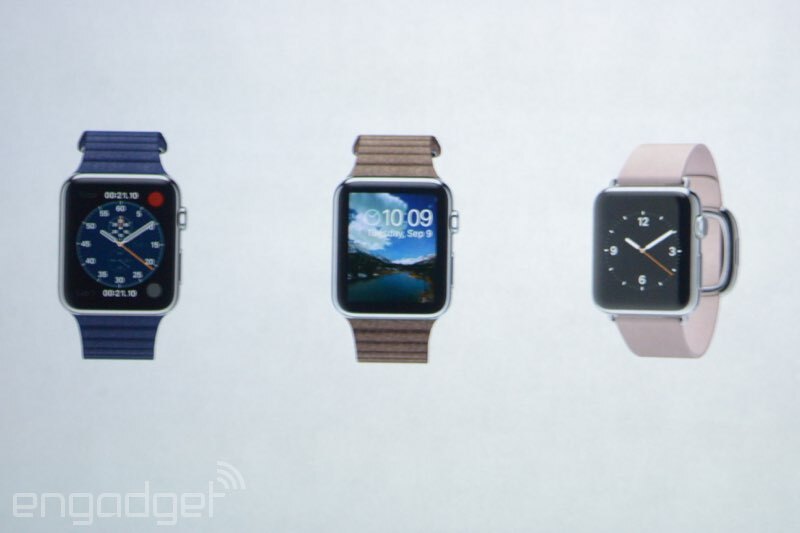 There's leather, polymer, metal mesh and stainless steel strap options. 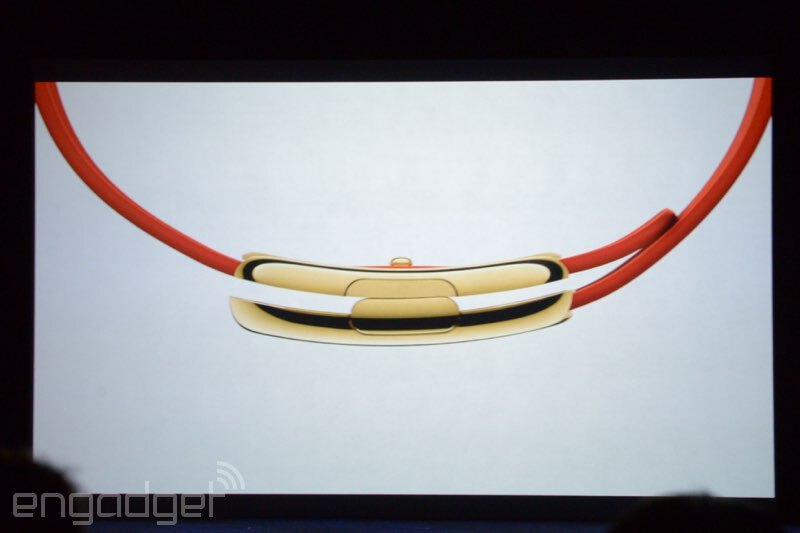 Some of these bands close with a symmetric clasp buckle. 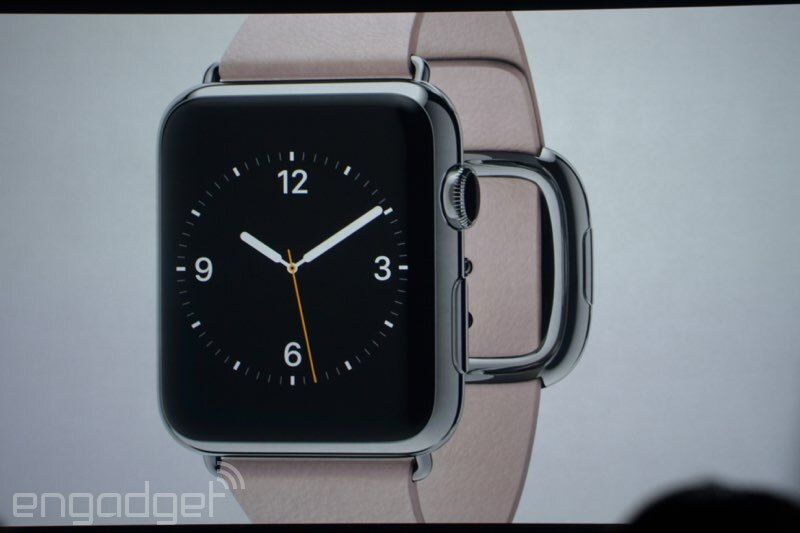 There are six different straps and a mechanism that makes those straps interchangeable. 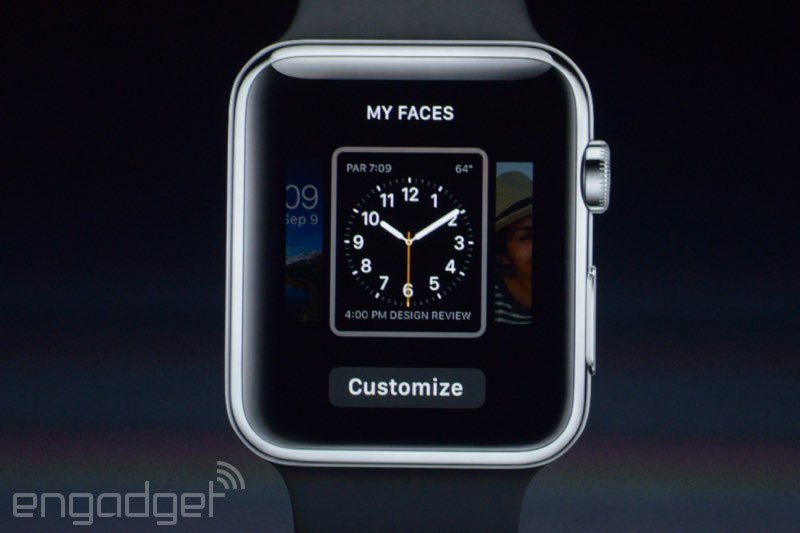 You can personalize the appearance and capability of these faces. "We know that wearing something all day every day becomes as much self-expression as it is functionality. 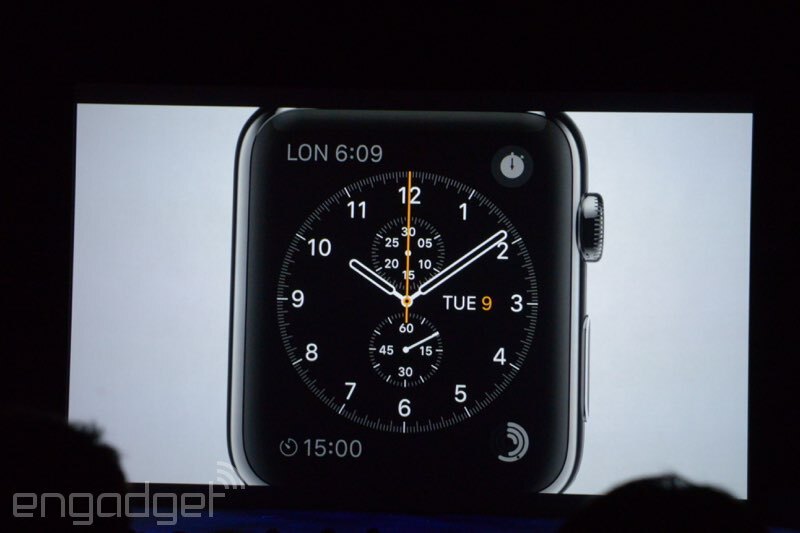 We've designed a range of watch faces." 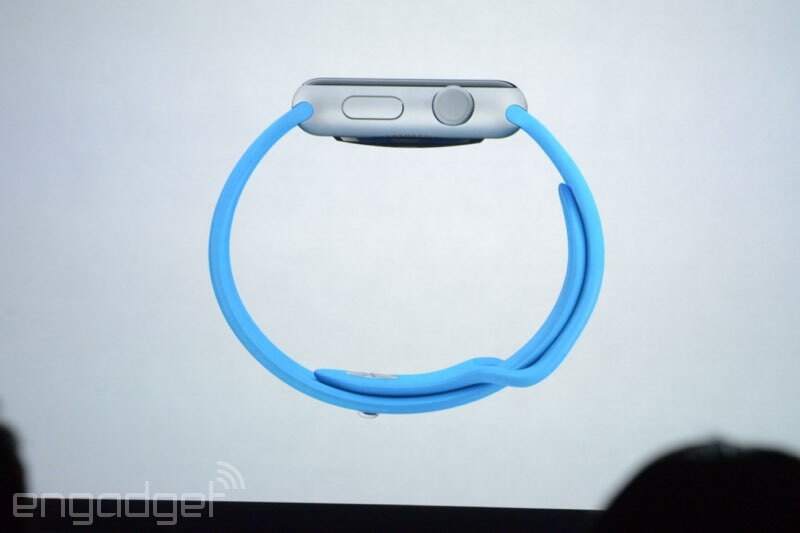 The back crystal also houses a charging solution, which is similar to the MagSafe charger. There are four LED lenses. 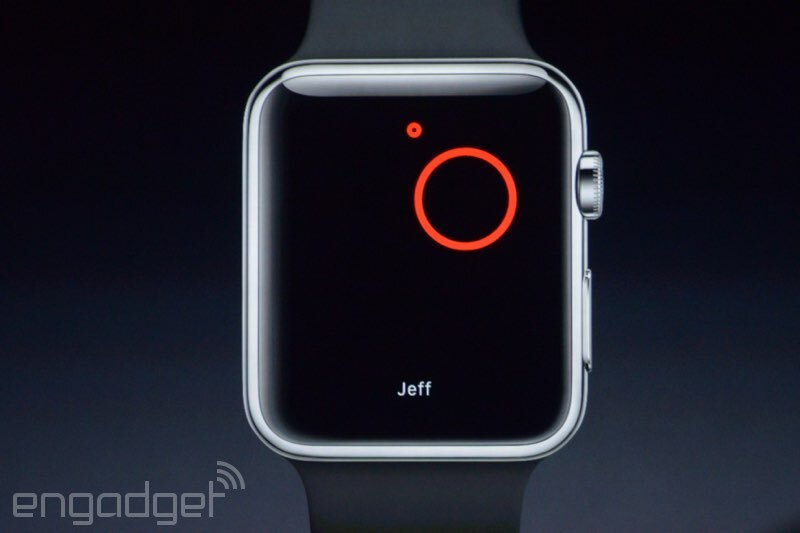 It detects your pulse rate. 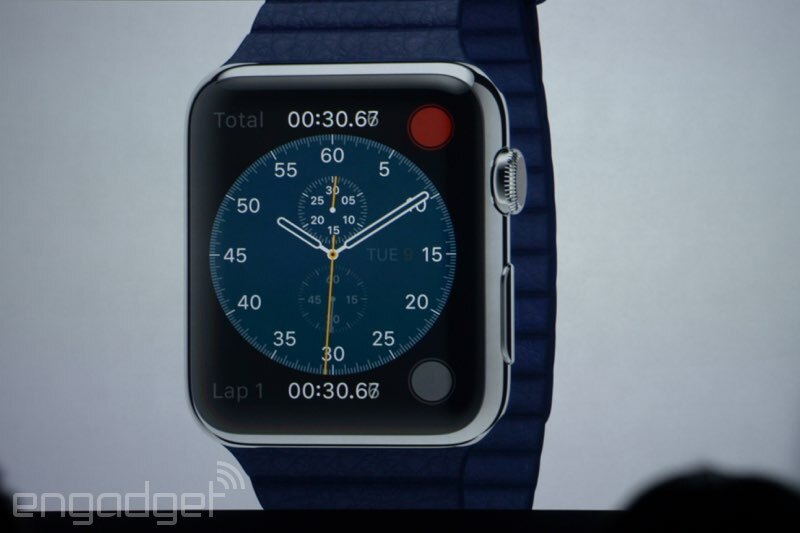 There's also a gyroscope and accelerometer. It's miniaturizing an entire computer system onto a chip. There's a custom-designed S1 chip that integrates many systems into one chipset. 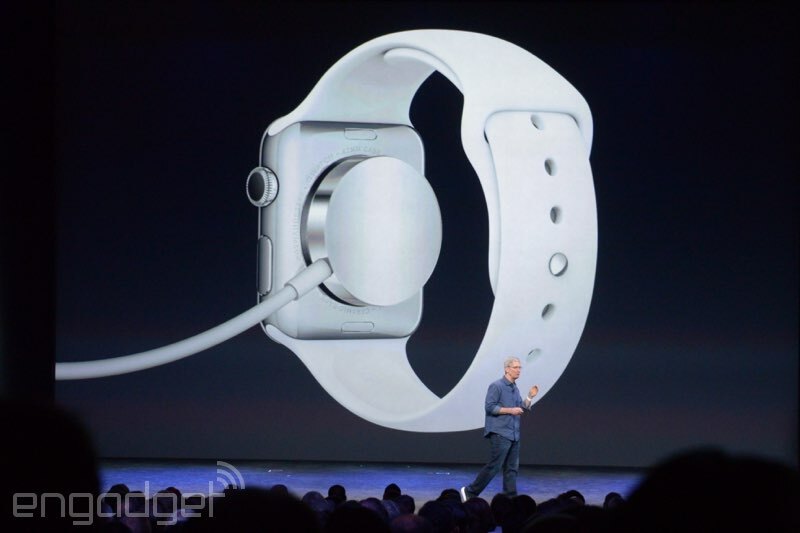 "We've had to invent other tech for a product this small. 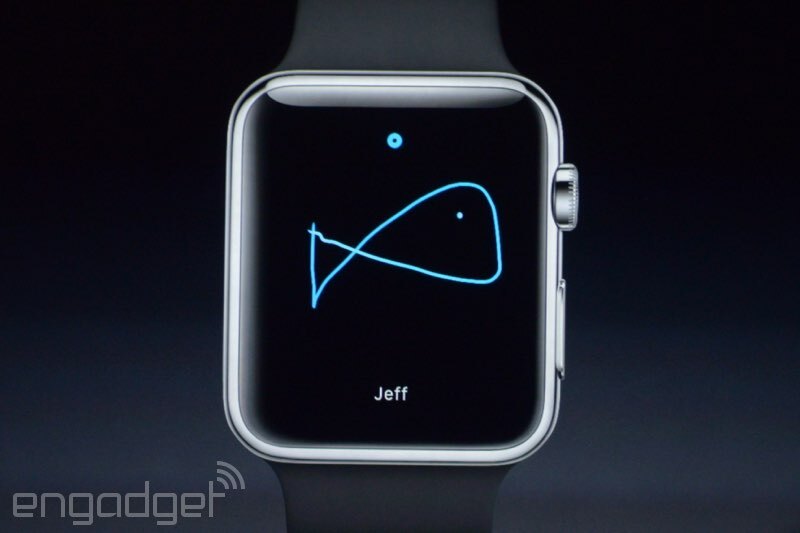 As well as sensing touch, the display also senses force quite literally. 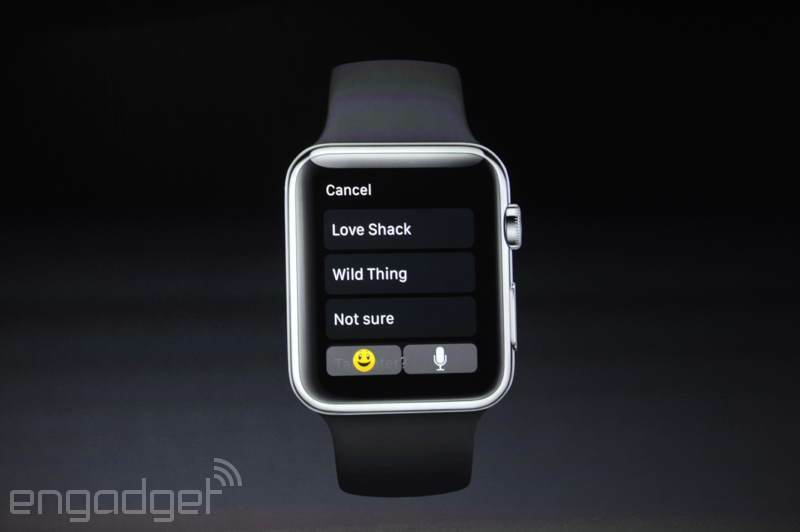 It can tell the difference between a tap and a press." 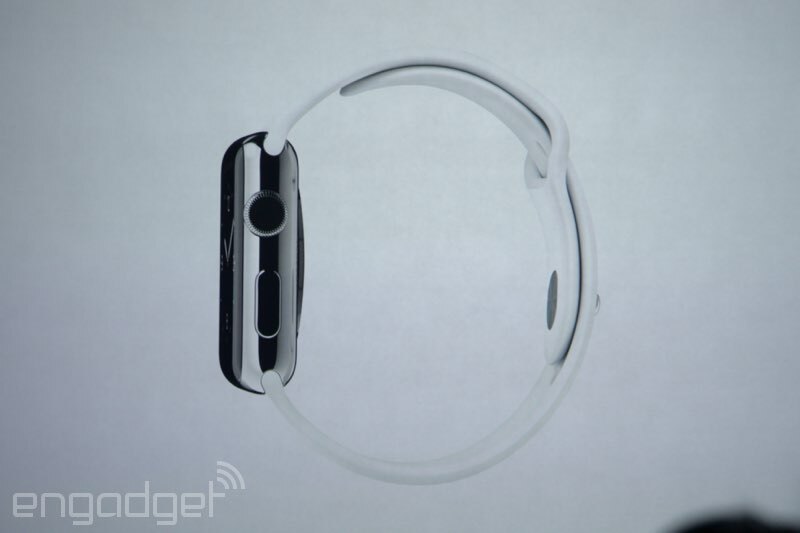 It has a flexible Retina Display. Machine-polished sapphire screen. 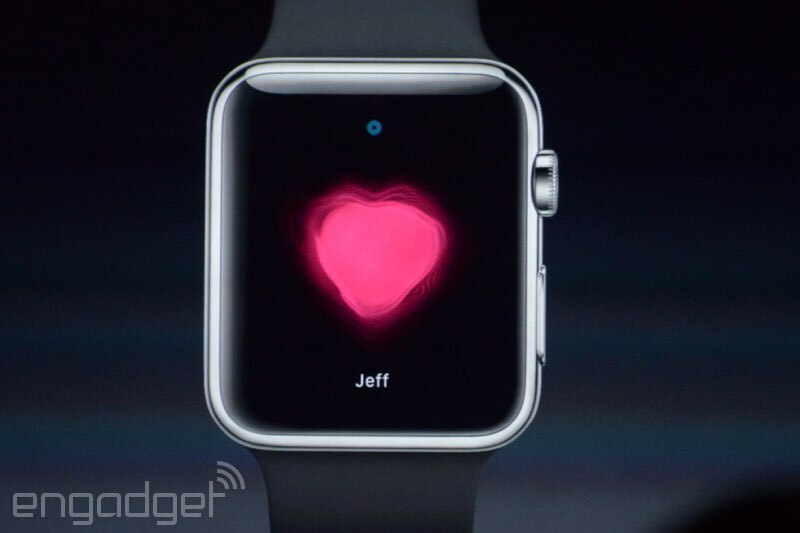 You can send sketches or even something as personal as your own heartbeat to another person. "This is something technology usually inhibits, rather than enables." The button below brings up a list of contacts. 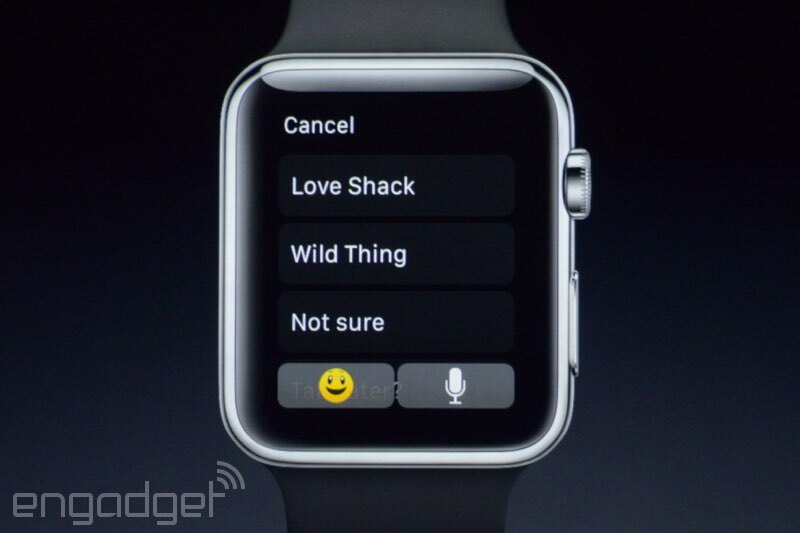 Looks like Siri is onboard. Messages with voice dictation. 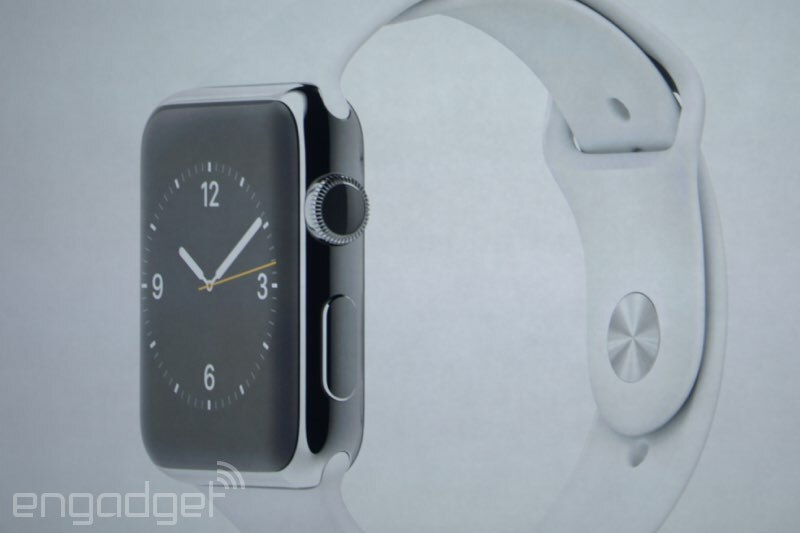 It's also the home button, that digital crown is. 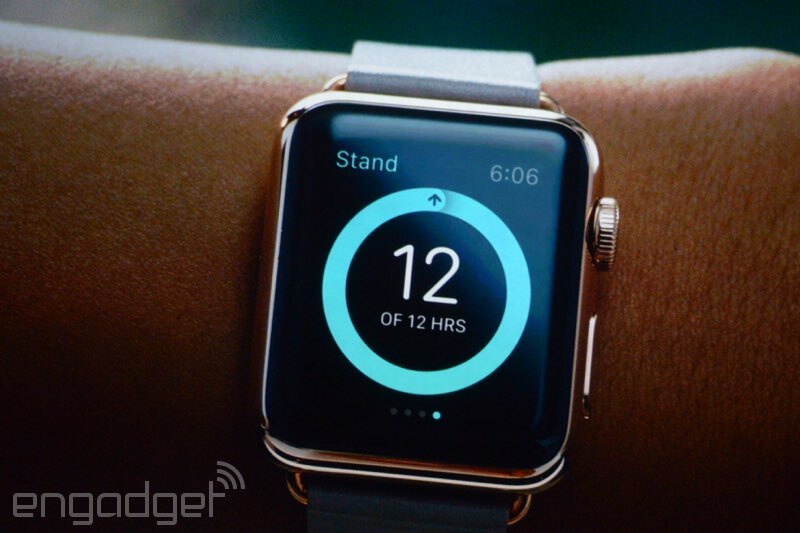 "The watch senses that you're raising your wrist, and you see an organization of apps that's somehow familiar. Information is fluid and vital. Magnifying content on a small display is important, so we developed an incredible input device (the digital crown)." 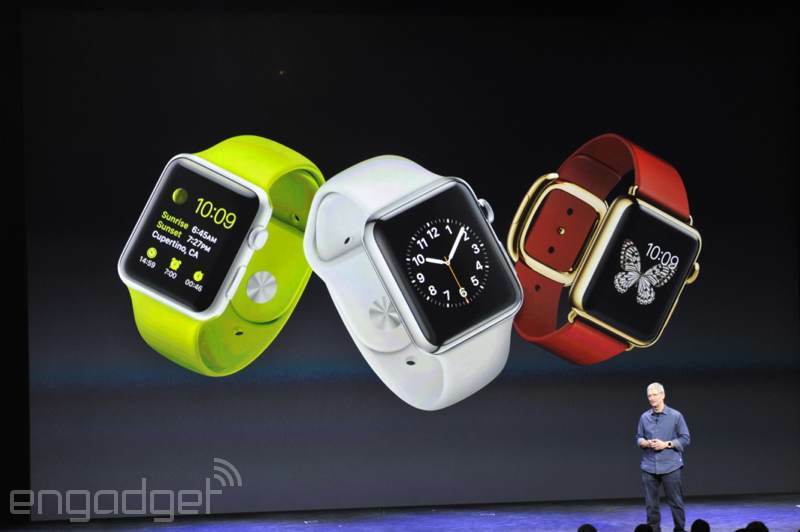 "We've designed a range of products so personal, you don't put them in your pocket, you put them on your wrist. We've developed the Watch as a singular product. You can't see a boundary between the materials and its software." "It's driven Apple, this compulsion to take incredibly powerful technology and make it accessible, relevant and ultimately personal." 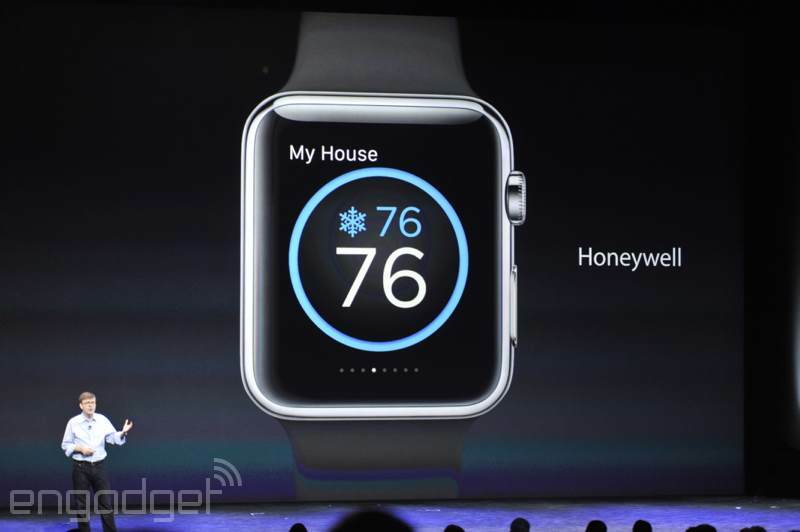 "Apple Watch has an amazing and rich design story." And now it's a Jony Ive video, as you'd normally expect. "It seamlessly combines the material from software and technology, and we thought not only of the function, but of the way it looked." 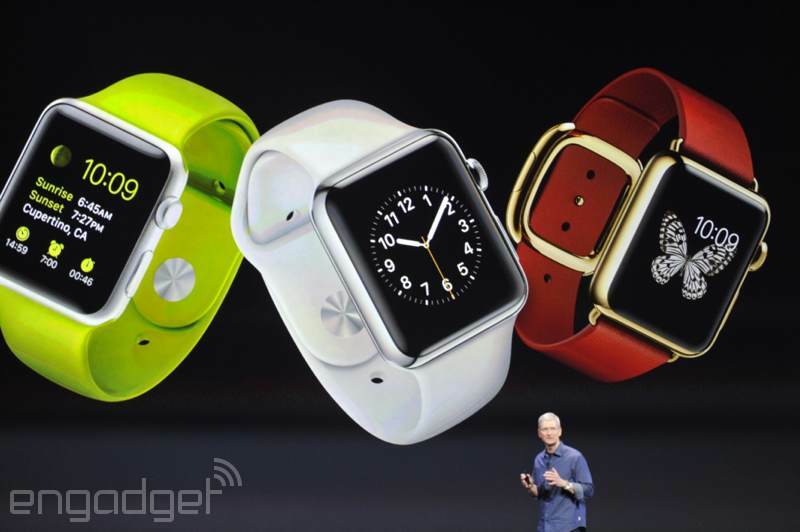 "Apple Watch is made to be worn, and it can be worn all day at any occasion." 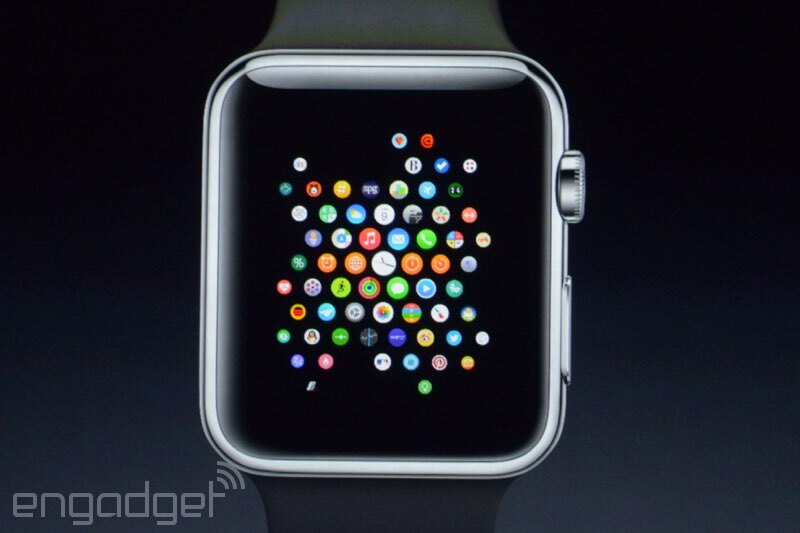 It zooms in and out on the map; it scrolls through lists without blocking the screen; if you're in an app, when you press the digital crown, it takes you back to the home screen. 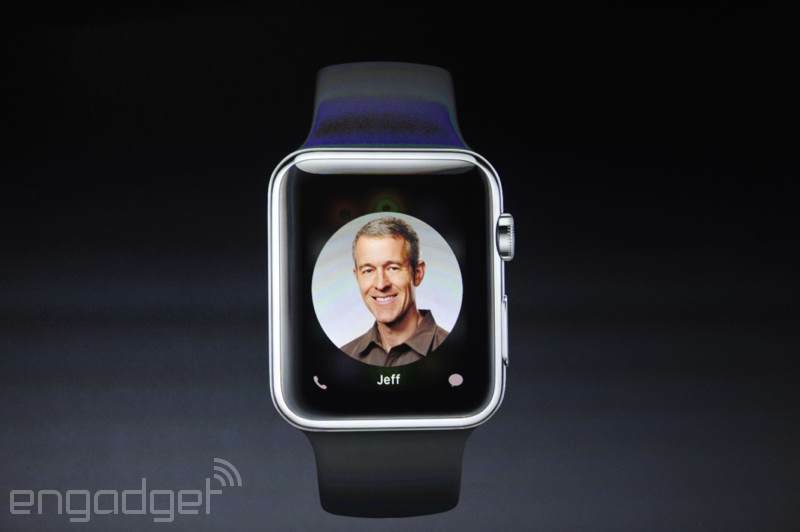 "We've placed extra functionality in the dial. It's called the Digital Crown." 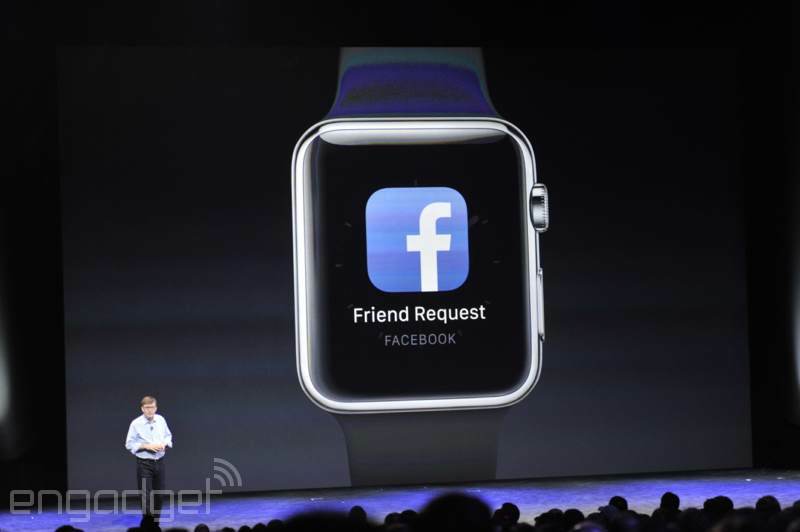 "What we DIDN'T do is shrink down the iPhone interface and put it on your wrist. That'd be a horrible experience!" For every new product category, a breakthrough in UI was required for Apple; the Mac's mouse; the clickwheel on the iPod; multitouch on the iPhone; the Apple Watch required the same attention. 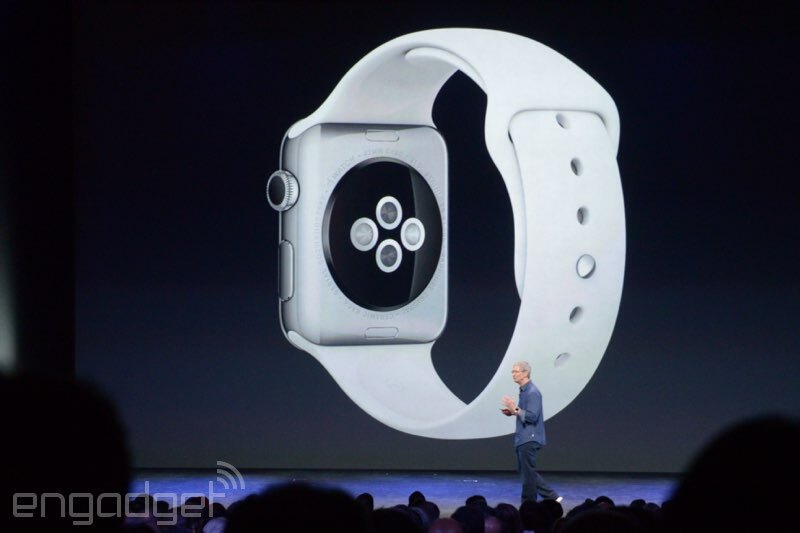 "Apple Watch took very deep thinking, and out of this came some remarkable innovations. One of those is the user interface." You can find one that fits your personalized style. 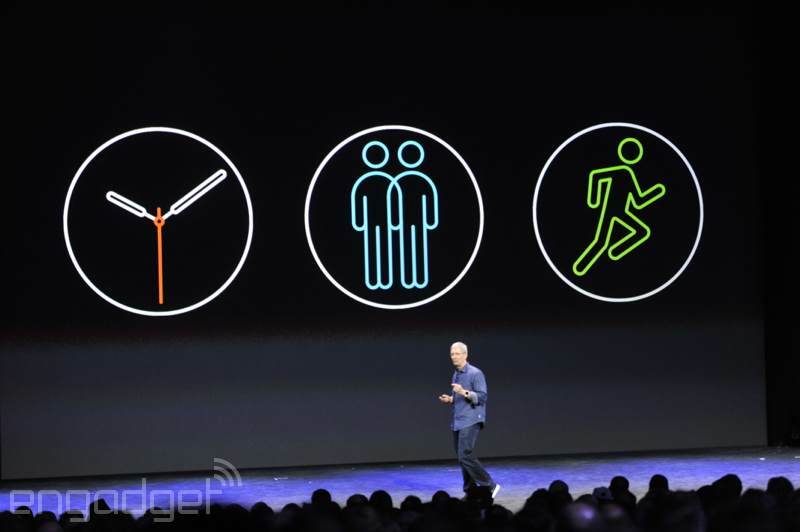 "We've invented new ways to communicate and connect, and works seamlessly with iPhone. 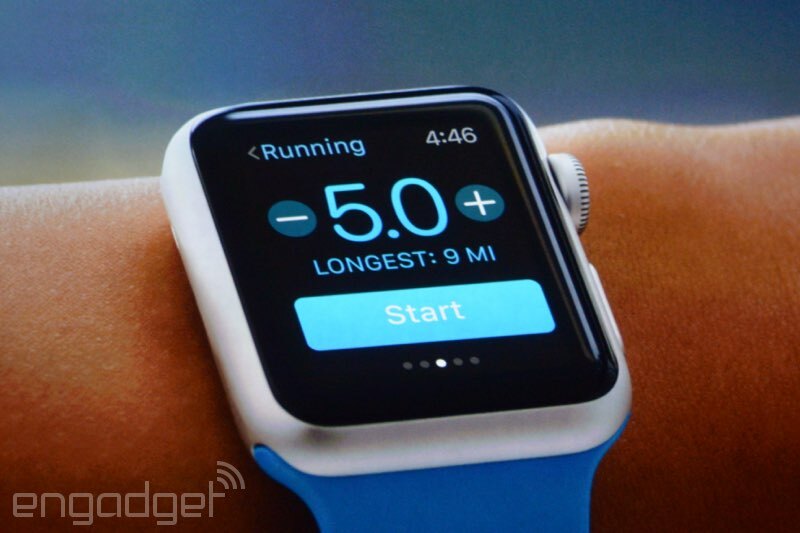 It's a comprehensive health and fitness device." 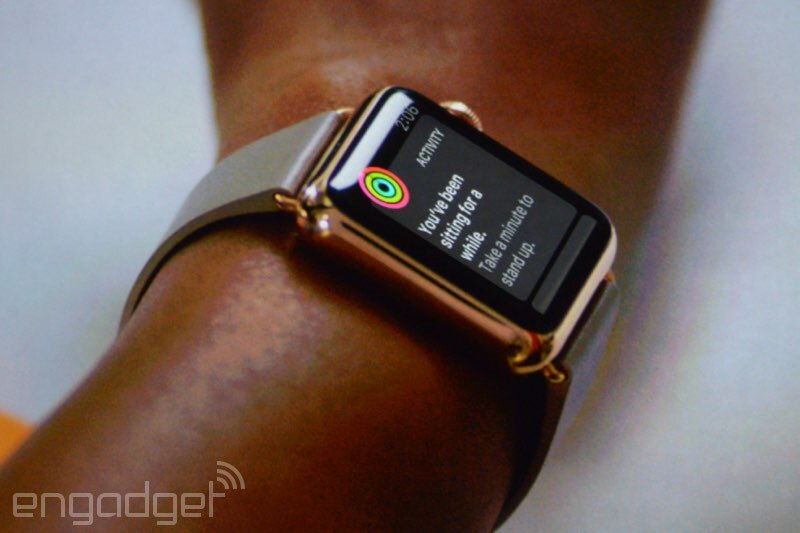 "This is the most personal device we've ever created. We set out to make the best watch in the world. One that is precise. It's synced with a universal time standard." 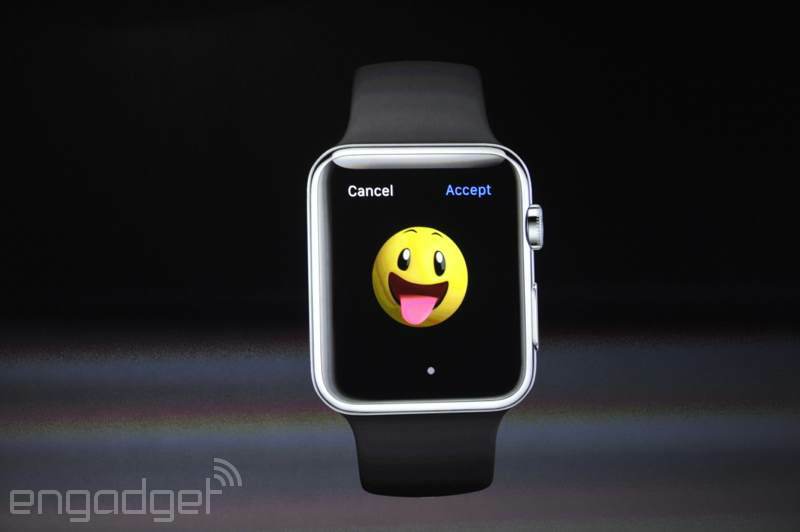 Apparently people are really into this smartwatch thing all of a sudden, and they just saw it for a few seconds. We've got a standing ovation here, folks. 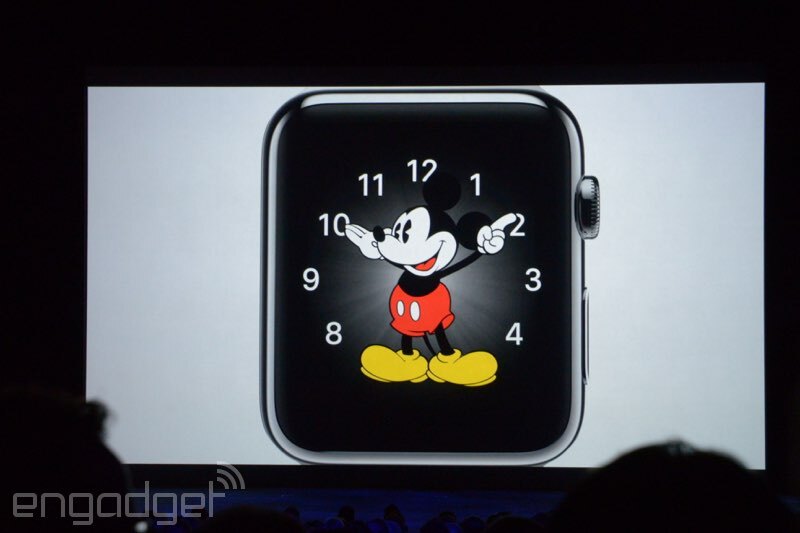 And it's called Apple Watch. There are several different bands, actually. 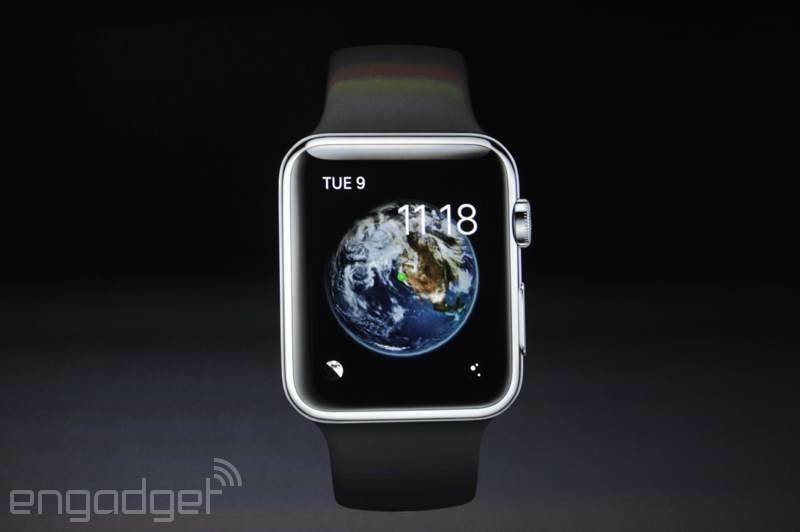 Stainless steel with sapphire screen. 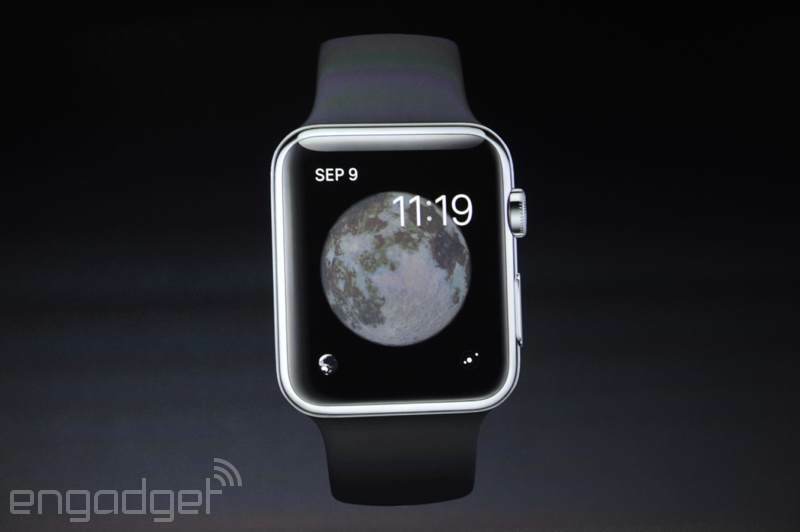 It's a squarish device with a metal band, home button and a rotating dial on the right side. 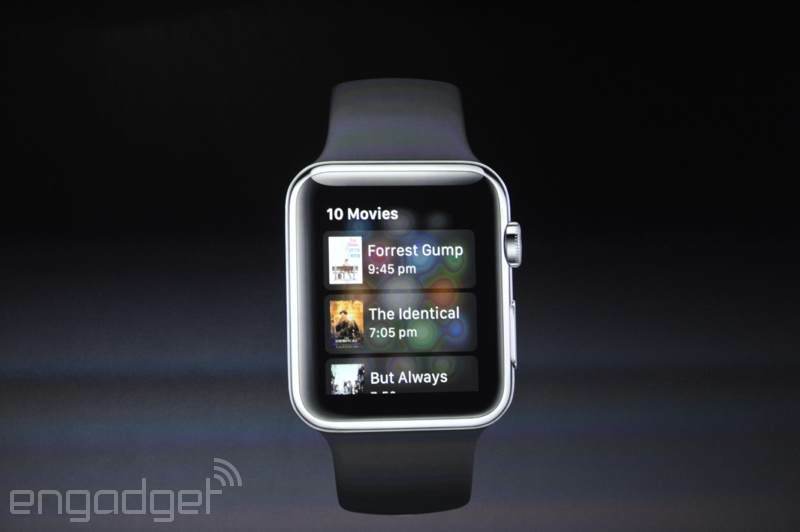 And there it is -- the watch! HUGE applause! Video shows the Earth from space, and then a glimpse at a device. Cameras up all over the place. Everyone in the crowd is poised and ready. "The next chapter in Apple's story." Video time. "I am SO excited and so proud to share it with you this morning!" "We believe this product will redefine what people expect from its category." 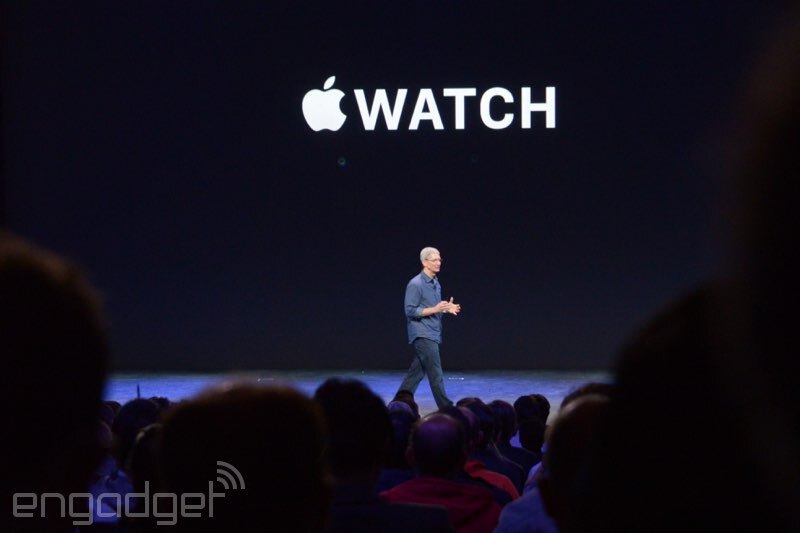 "We've bene working hard for a long time on an entirely new product." Tim's talking about integrating hardware, software and services seamlessly. "We've really seen enough to call it a day. But we're not quite finished yet." 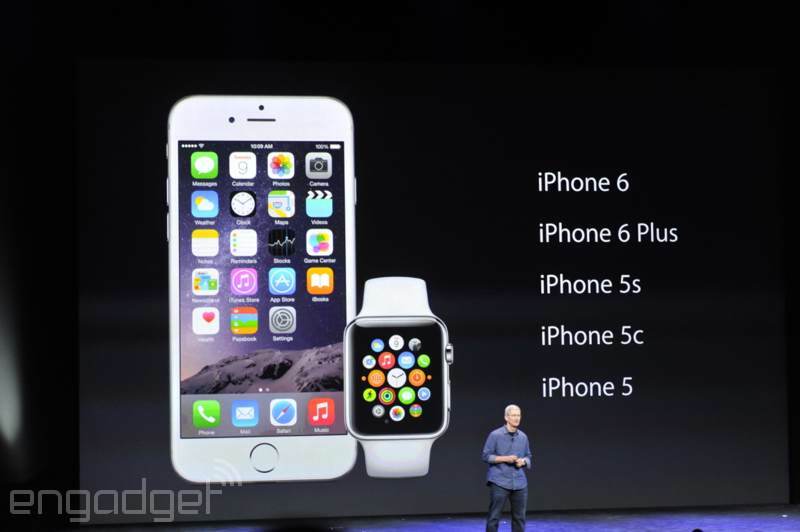 "This is why iPhone 6 and 6 Plus are the biggest advancements in the history of the iPhone." Phil's done; I sure like the cut of his jib. Tim's back on stage. Sephora, Starbucks, Panera Bread and Instacart. 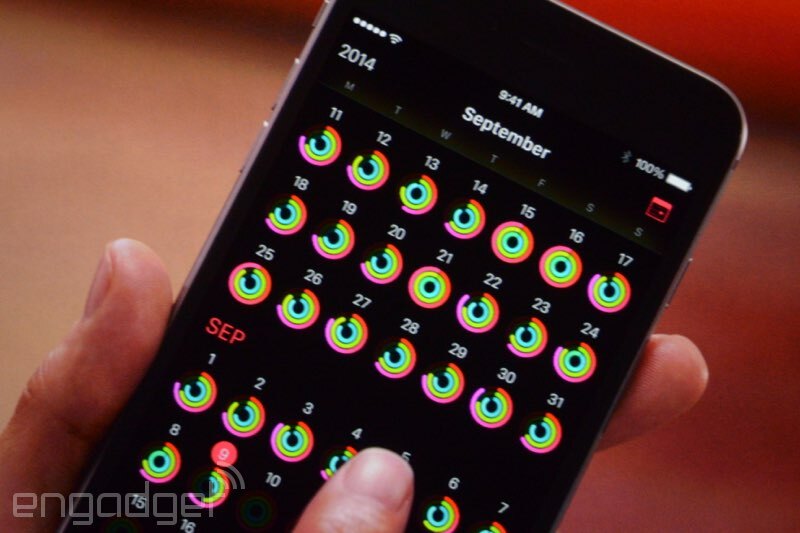 Pay is launching in October 2014 as a free update to iOS 8. Groupon is also onboard; same with Uber, with a feature called "Ride Now," which doesn't require you to open an account with Uber at all. MLB.com At Bat. The Apple online store. And OpenTable. Target will integrate Pay into their app. "I don't know about you, but I"m checking out Beats headphones." With Pay, there's one-touch checkout for e-commerce; there's no card number entry, no typing addresses, no card info shared with the merchant. And Disneyland/Disney World in time for Christmas! And, naturally, Apple retail stores. Shocker. Macy's and Bloomingdales; Duane Reade and Walgreens; Staples; Subway; McDonald's (which is also adding Pay to its drive-thru). 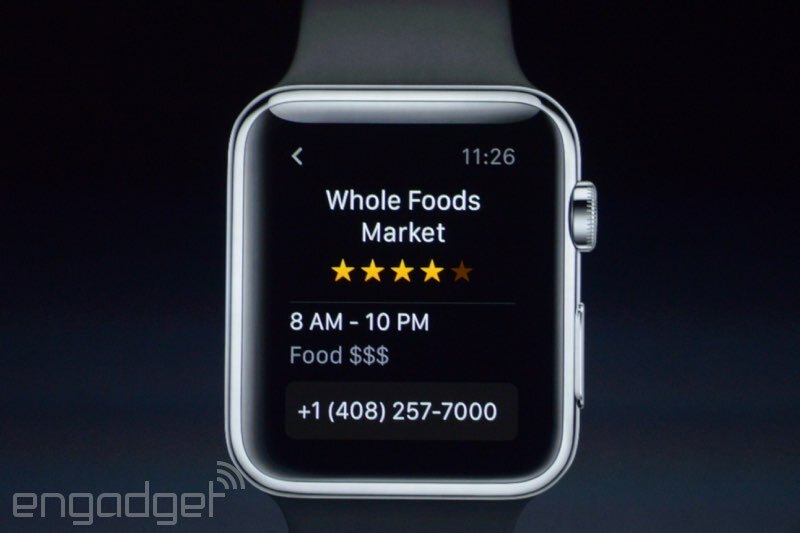 Whole Foods is included as well! Lots of applause for that. Quite a few banks are listed as supporting Pay. Pay starts in the US with Amex, Mastercard and Visa support. Or your code, or your number. "Security is at the core of Pay, but so is privacy. We're not in the business of collecting your data." Apple doesn't know what you bought, where you bought it or any other details about the transaction. The cashier doesn't even see your name. You can also suspend payments from that device if it's lost or stolen, so there's no need to cancel your credit card. When you add a new card, they don't store the card or give it to the merchant. They use a one-time payment number along with a dynamic security code, so there's no longer a static code on the back of the card. It works by adding a new card to your iTunes account, and it gets added to Passport. Finally, this is what Passport was designed to do. 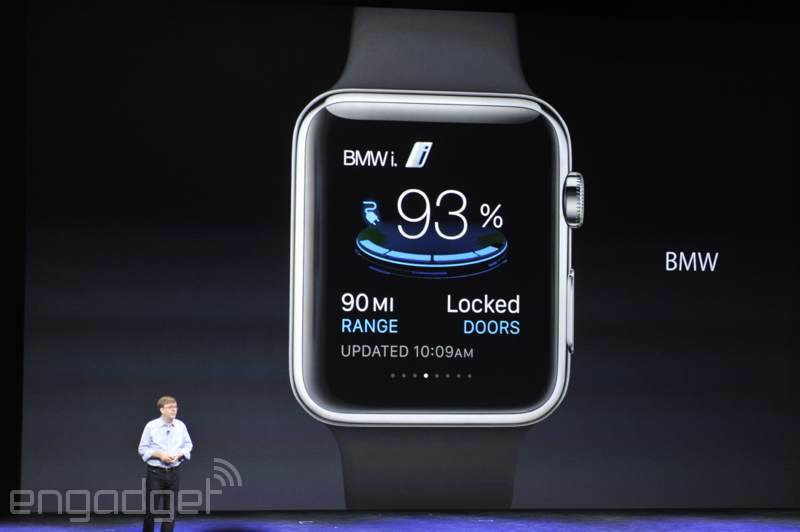 They use NFC (Near-Field Communications), Touch ID and a Secure Element chip that stores your encrypted info securely. 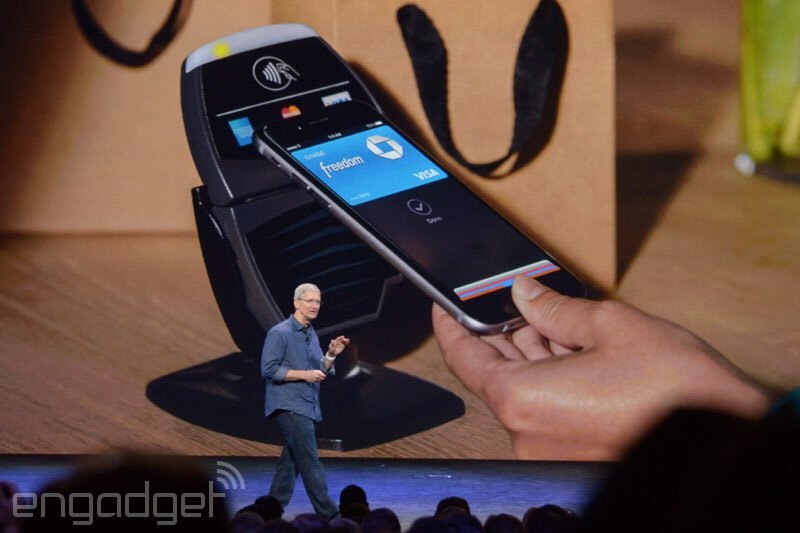 Pay is built into the 6 and 6 Plus. 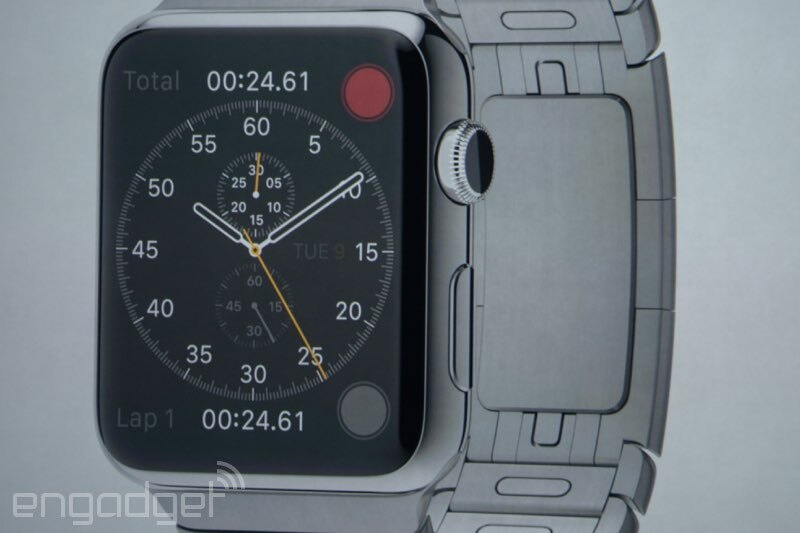 Speaking of payments, we'd like to thank Verizon for helping us bring you this here liveblog. 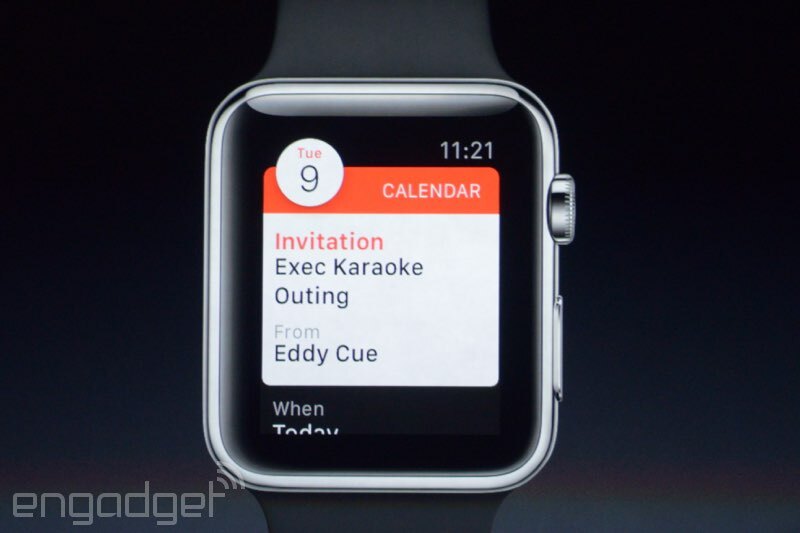 Tim's inviting Eddy Cue to the stage to tell us more about Pay. Tim showed a brief video showing how quick it is to use it... twice. 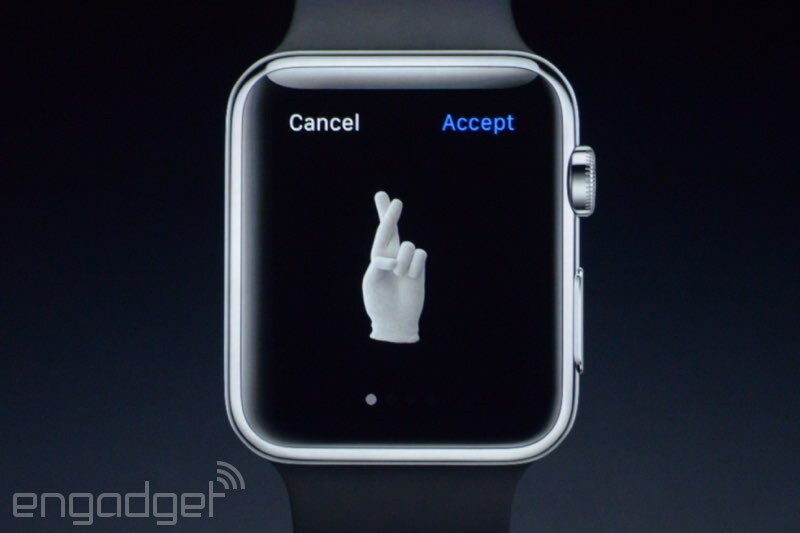 You use Apple Pay by holding your thumb on the Touch ID button. "This is exactly what Apple does best. 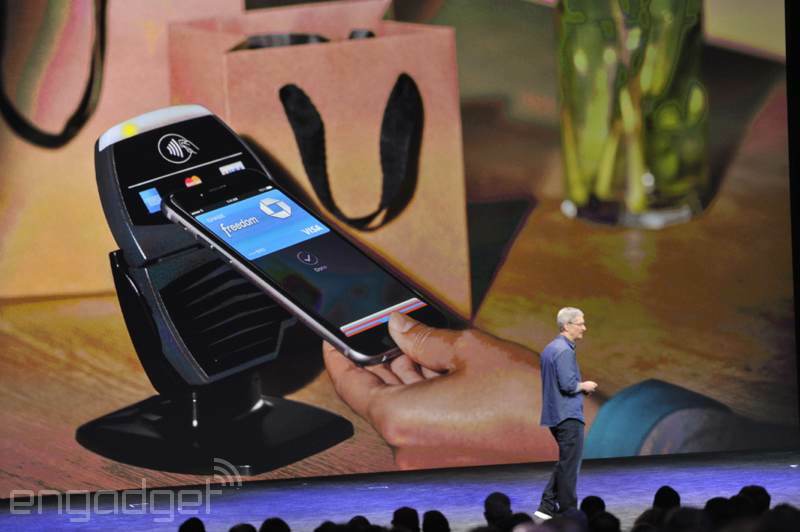 We've created an entirely new payment process, and we called it Apple Pay." 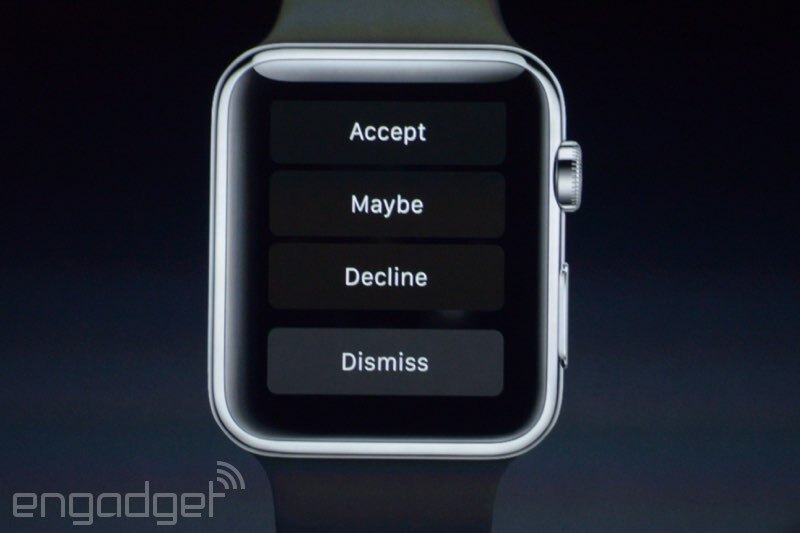 Now Tim’s on to talking about payments, another feature that’s been long-rumored with the iPhone. They've got an a capella group singing and showing off some of the features. Pretty cute, and there's a lot of huge applause. It’s Justin Timberlake and Jimmy Fallon behind the vocals! They've got an a capella group singing and showing off some of the features. Pretty cute, and there's a lot of huge applause. Here are a few ads for the iPhones. "A great product isn't just a great collection of features; it's about how they work together. How they make you feel." Phil's exited stage, and Tim is back. 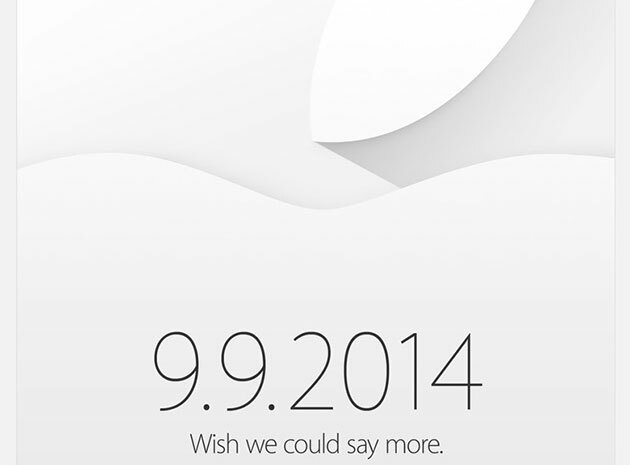 You'll be able to download iOS 8 on September 17th. Ships September 19th in several countries, and pre-orders will be September 12. It’ll be in 115 countries by the end of the year. The iPhone 5c is free, the 5s is $99. 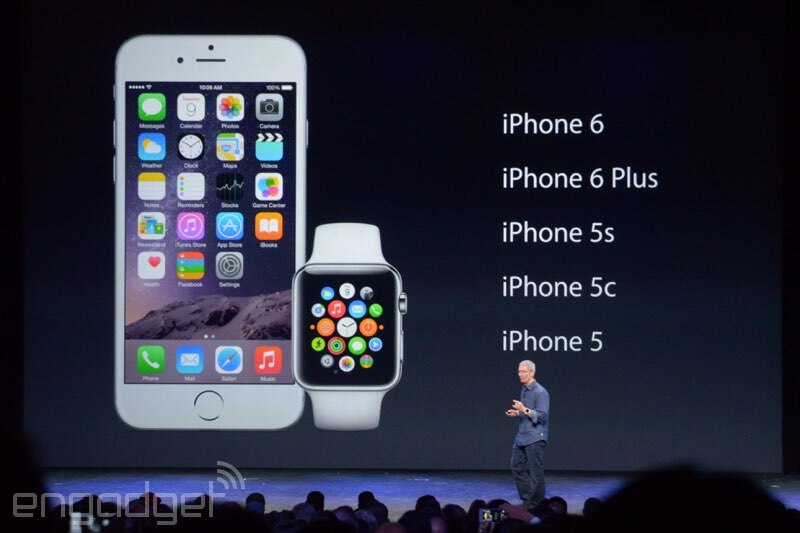 The 6 Plus starts at $299 and has the same memory configuration. 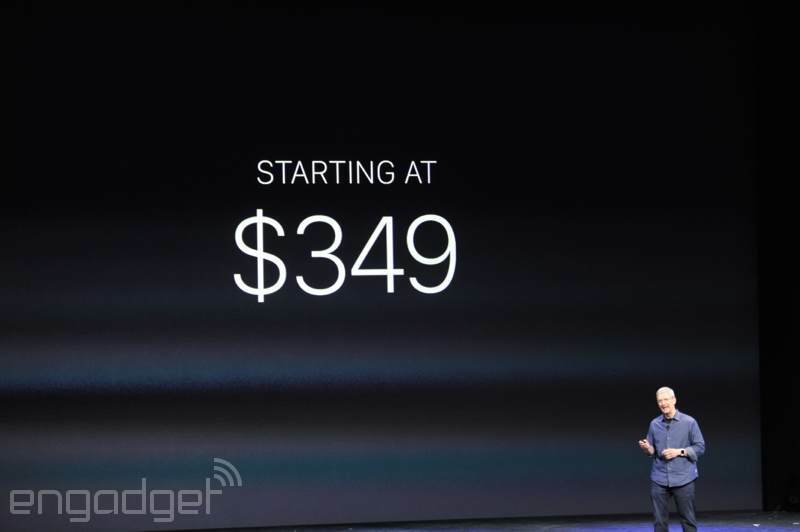 Starts at $199 on contract, going up to $399 for the largest model. Starts with 16GB and then jumps to 64GB and 128GB! 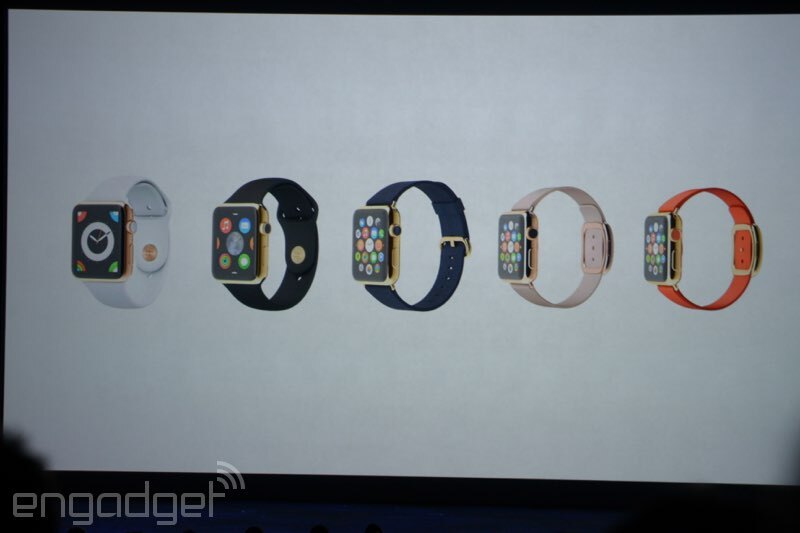 6 comes in gold, silver and space gray. 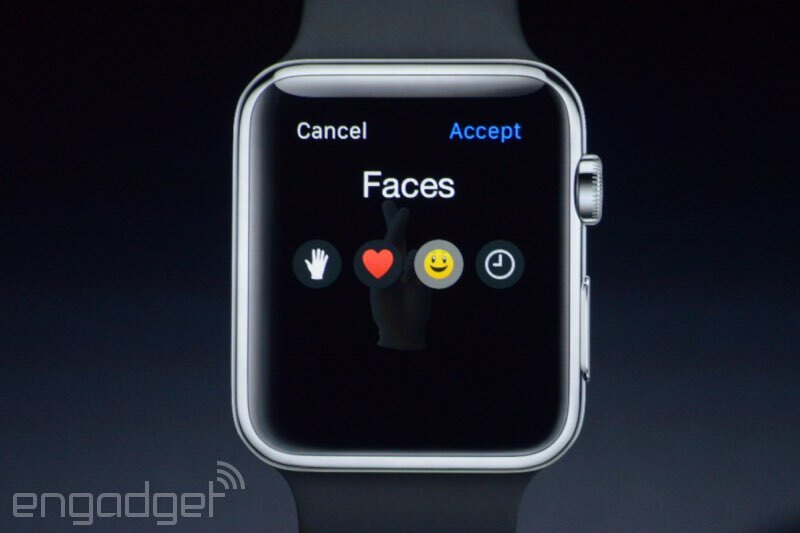 You can share audio messages and there's a new controller for one-handed use. A new keyboard with Quicktype. 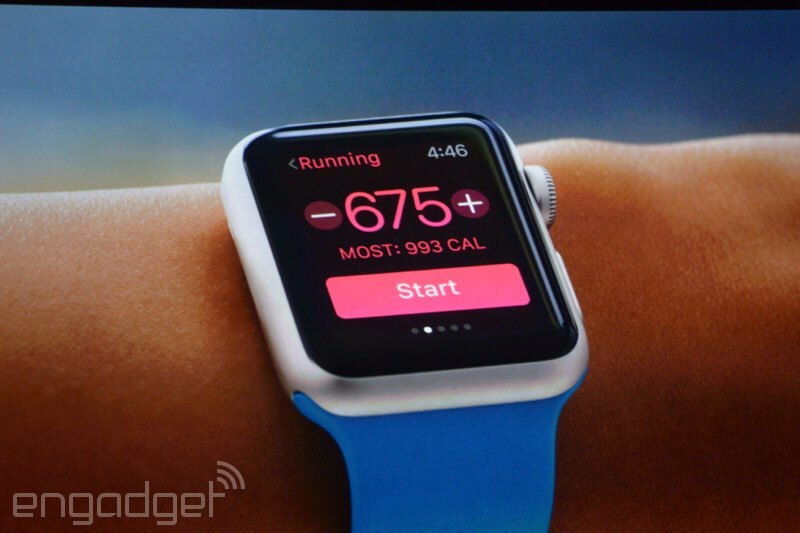 New Health app, and a lot of extensibility, with notification center widgets. 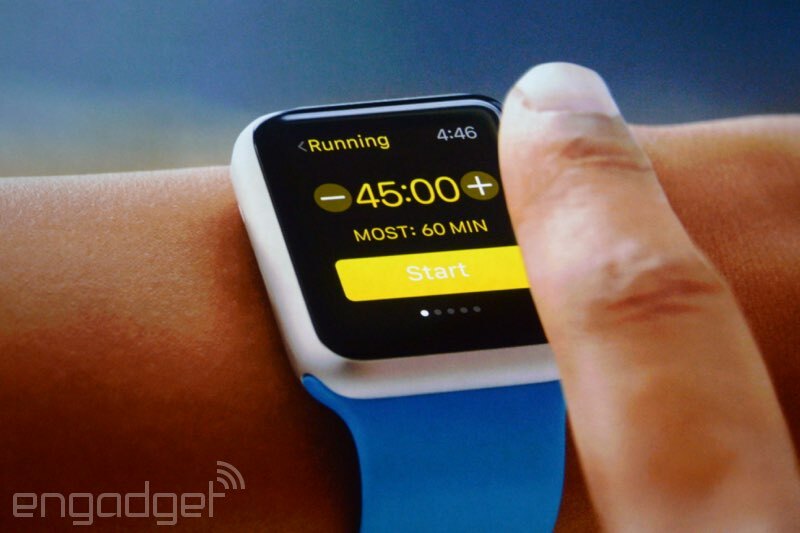 Obviously, they'll come with iOS 8. Now Phil will go into features, like messages. It also does single-shot HDR photos, which brings great exposure to the background and foreground. "You know your kids are going to do that." There's a new FaceTime HD front-facing camera, with a new sensor that brings in 81 percent more light and improved face detection, as well as burst selfie mode. With Focus Pixels, you can do continuous autofocus. He's showing off a slo-mo video, which looks like something out of the Matrix or a Michael Bay movie. 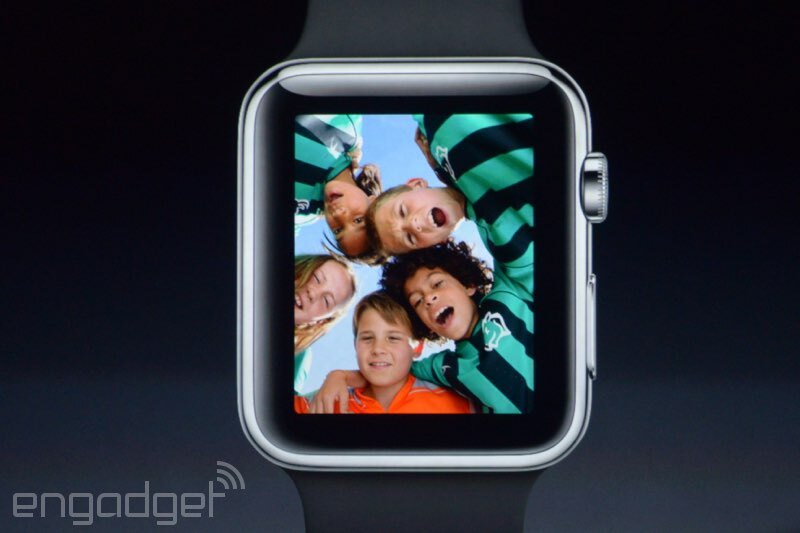 It comes with 1080p video at 30fps or 60fps, as well as slo-mo video up to 240fps. Phil is reminiscing about dedicated cameras and camcorders. "I'd bet the iPhone has become the world's most popular camcorder." 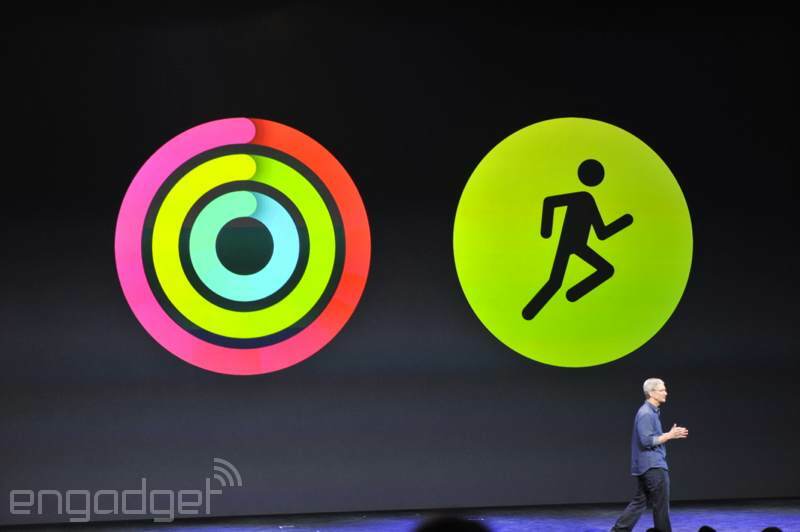 Both phones have almost identical camera features, but OIS -- optical image stabilization -- is going to be on the 6 Plus. 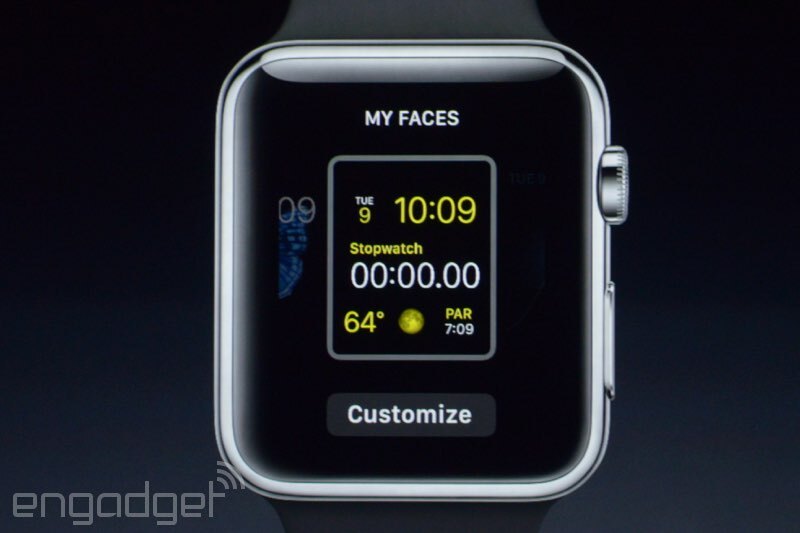 There's advanced face detection and "best shot" mode. The ISP is part of the A8 chip. 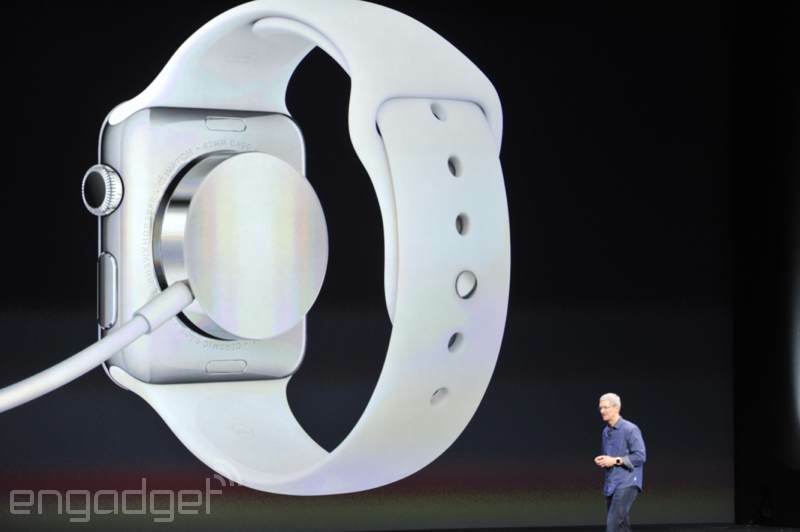 With a new-generation gyroscope, the stitching should be better than before. Panorama mode is up to 43MP now. Phil's going to show some pics taken by the 6 camera. It looks great, though we'll be the judge of it when we get the chance to use it. Next-gen local tone mapping and advanced noise reduction are included here. Focus Pixels: As the lens moves in and out, it can tell if an object is in or out of phase. Phase Detection Autofocus is featured here. It has an 8MP iSight camera, with True Tone flash; large, 1.5-micron pixels; and f/2.2 aperture. 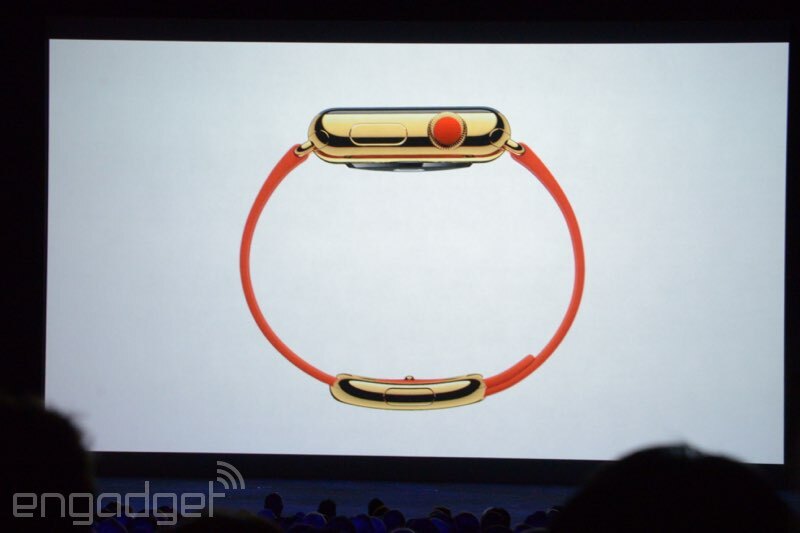 There's also a new sensor in it to take better photos. 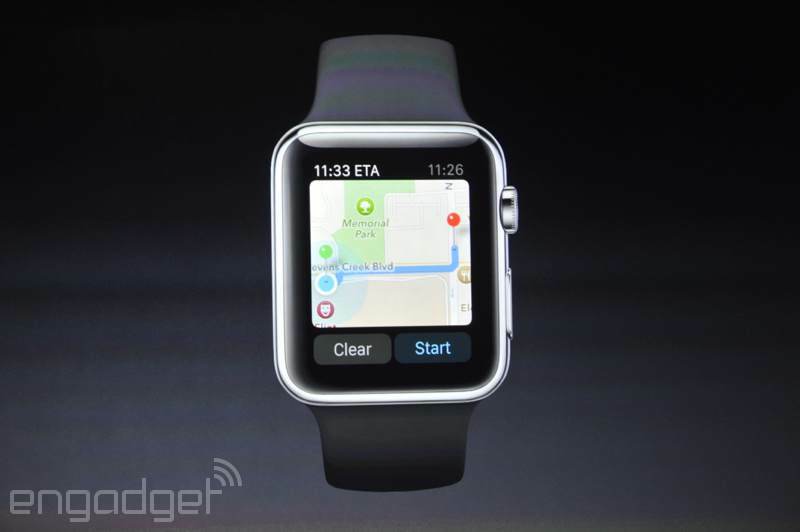 It will have seamless handoff capabilities as you go from WiFi to cellular and vice versa. 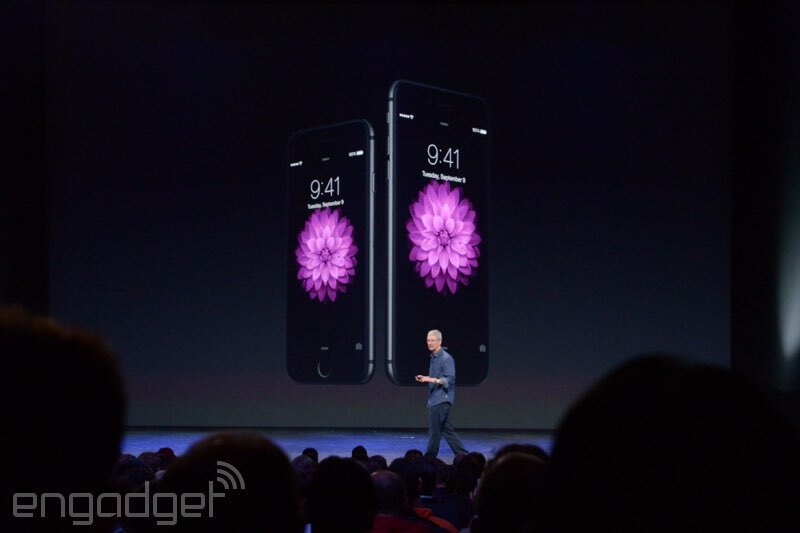 WiFi calling will be available on the 6 and 6 Plus. VoLTE helps make calls more clear. Verizon, AT&T, T-Mobile, all three South Korean carriers and others around the world. VoLTE support is included as well. 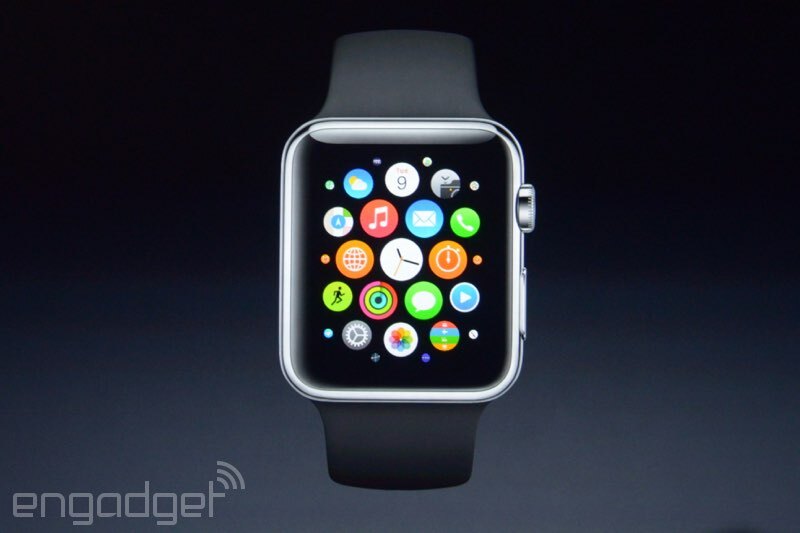 It uses carrier aggregation, and comes with 20 LTE bands. Apple is working with 200 LTE carriers around the world. There are new advanced wireless specs -- 150 Mbps LTE. 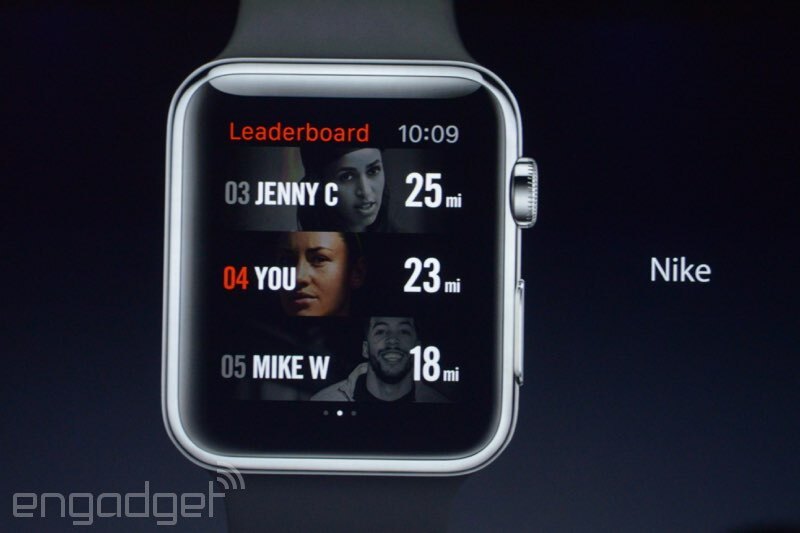 Nike's also working on a new version of the Nike+ app. This is reflected in the health app. There's a new sensor -- the barometer. It measures relative elevation from air pressure. 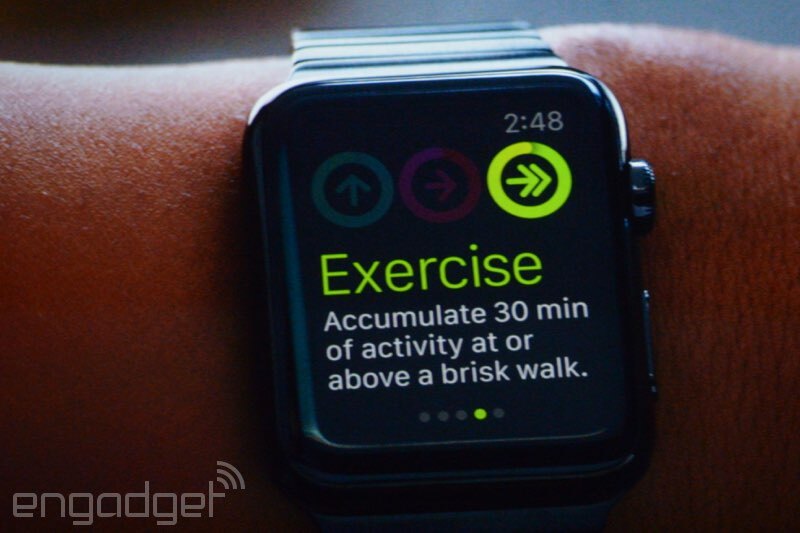 It can estimate distance; it can also measure elevation changes as well, such as stairs. 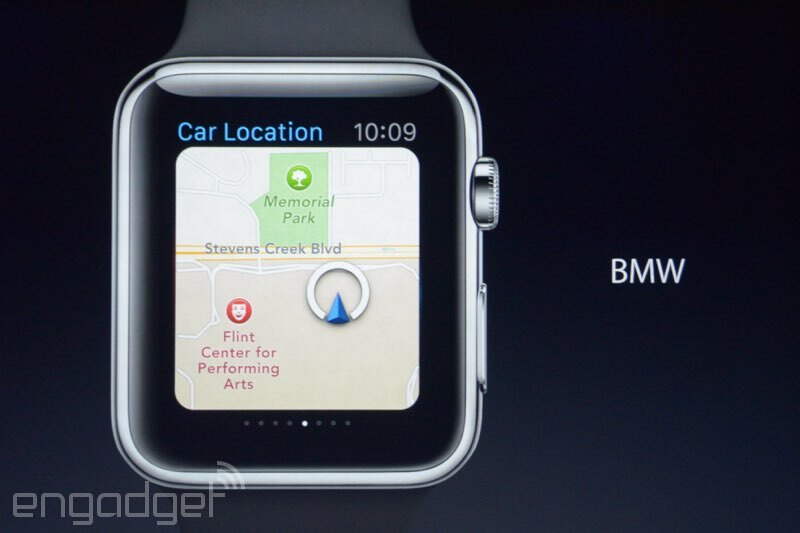 A new M8 motion coprocessor is there, too. Stats: 14 hours of 3G talk time for the 6, and 24 for the Plus. 10 days standby for the 6, 16 for the Plus. 11 hours of video for the 6, 14 for the Plus. 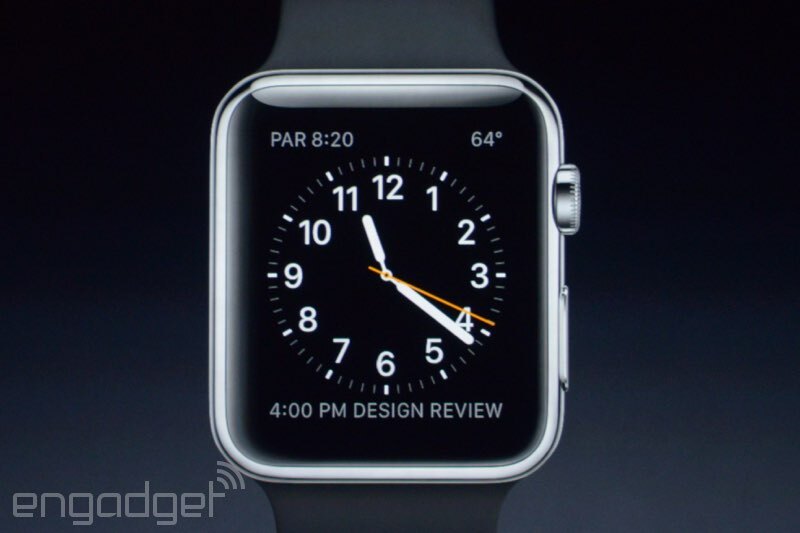 "Larger display, thinner design, incredible performance -- that impacts battery life. 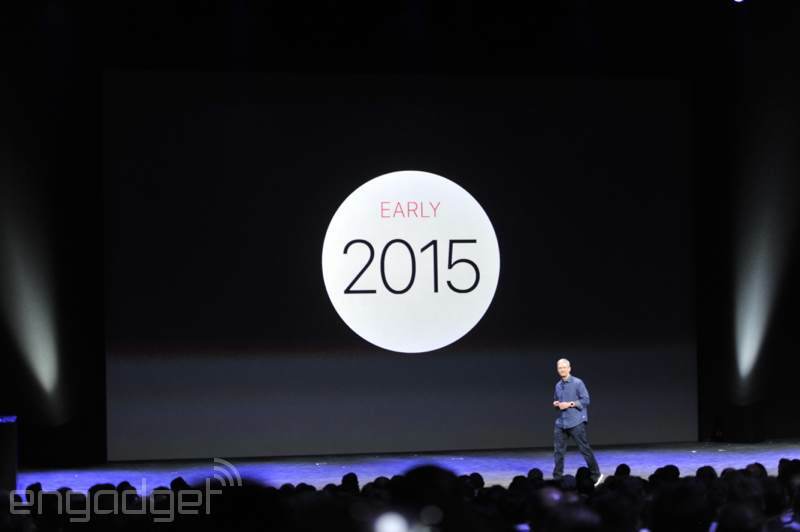 The team has worked hard to make the iPhone 6 and 6 Plus with better battery life." "That's not bad for their very first game." Sherman is done showing off Vain Glory, and Phil's back. There's also a massive monster that, if caught, will help your team win. New lighting effects and more than 100 fully animated characters interacting at once. It's like capture the flag, but with crystals. The game uses Metal. This is the most popular game genre in the world. Vain Glory brings this gaming experience to iOS. You play a unique character with unique abilities. Plant seeds to grow onions that like to dance. Vain Glory is a multiplayer battle arena. Super Evil co-founder Stephan Sherman is coming on stage to show off his games. Epic, Ubisoft, Gameloft, EA, Disney and Super Evil MegaCorp, among dozens of others. Tons of game developers are on board. "Traditionally, 3D chips are made with OpenGL. But it comes with a performance penalty, a lot of overhead." 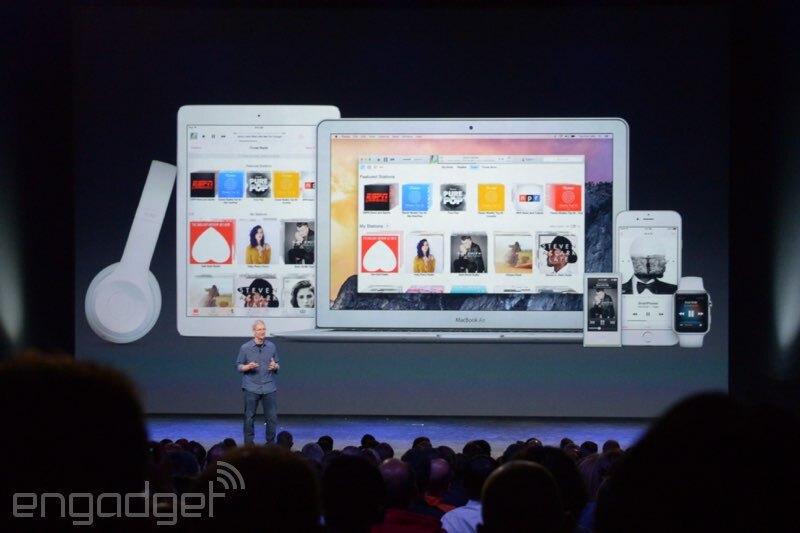 With Apple's Metal platform, you don't have that problem. The A8 can drive performance for a longer sustained period of time, such as when you're gaming. It's up to 50 percent more energy efficient than the last-gen chip. The A8 is 50 times faster than the original iPhone. It boasts 25 percent faster CPU performance. 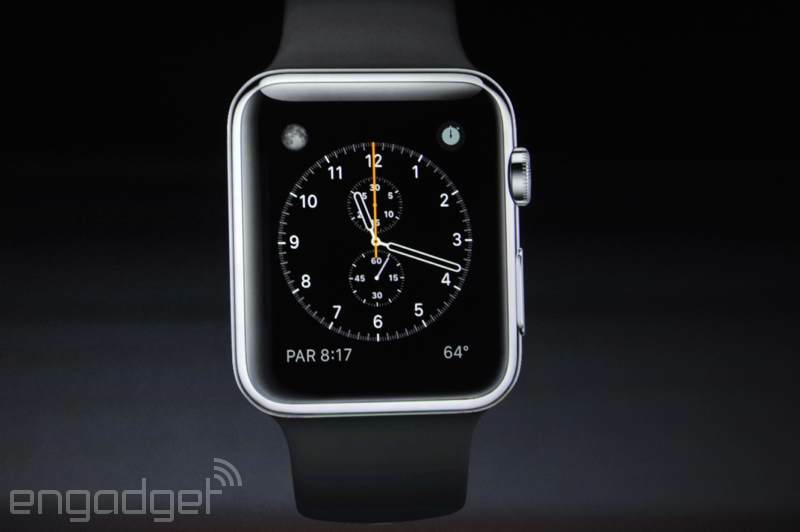 It's a 13 percent smaller chip than the A7. New generation A8 chip, 2 billion transistors and 64-bit support. It's a 20nm process. "That doesn't come close to telling the story to why these are the best phones ever made." Phil's showing the CNN site, which works horizontally in landscape mode. There's a desktop-class scaler to take advantage of the different sizes. The Xcode software now takes advantage of the new displays. But what about the legacy apps? "They just work." 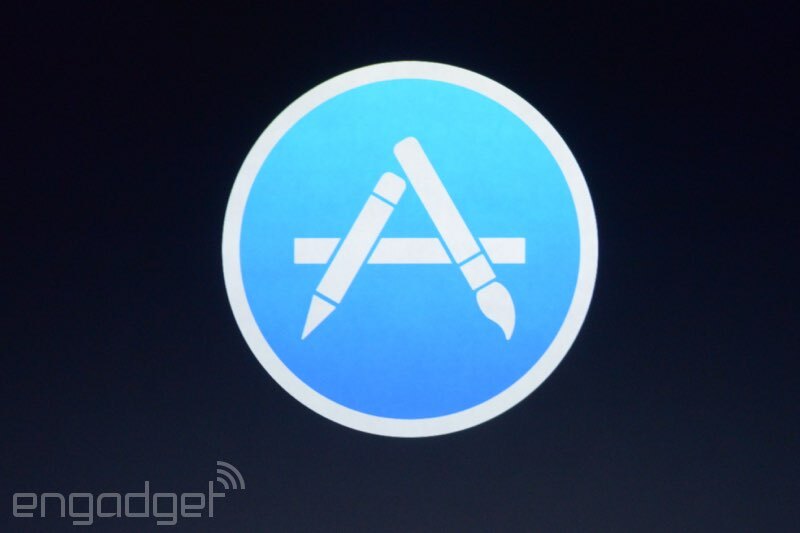 Now talking about apps, with 1.3 million apps in the App Store now. 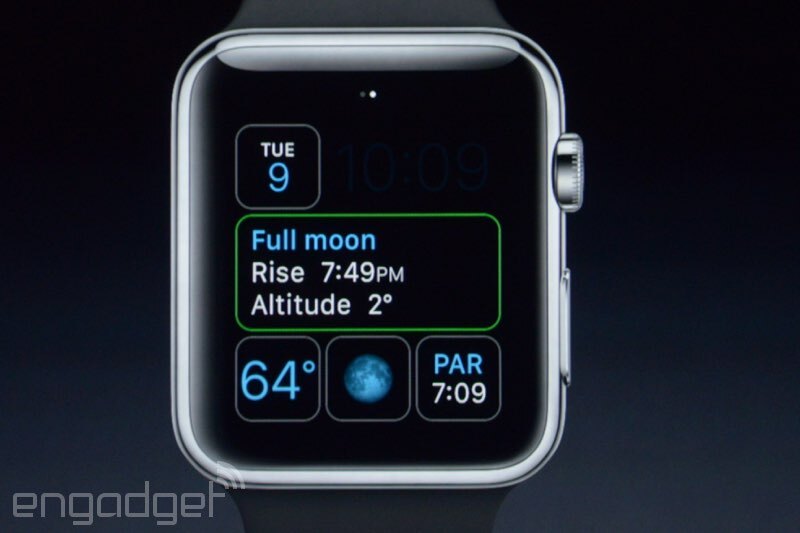 So that's the one-handed mode for the larger screen. If you double-touch the Touch ID button, everything moves down to the lower half of the screen. Then you tap again and it'll move right back to the full-screen mode. You can also see the springboard in landscape mode on the Plus. 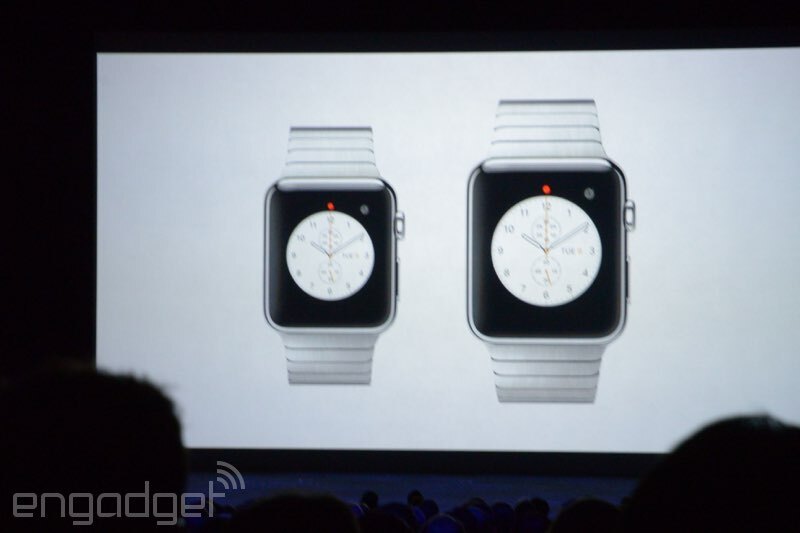 They're both thin; 6.9mm for the 6, 7.1mm for the Plus. 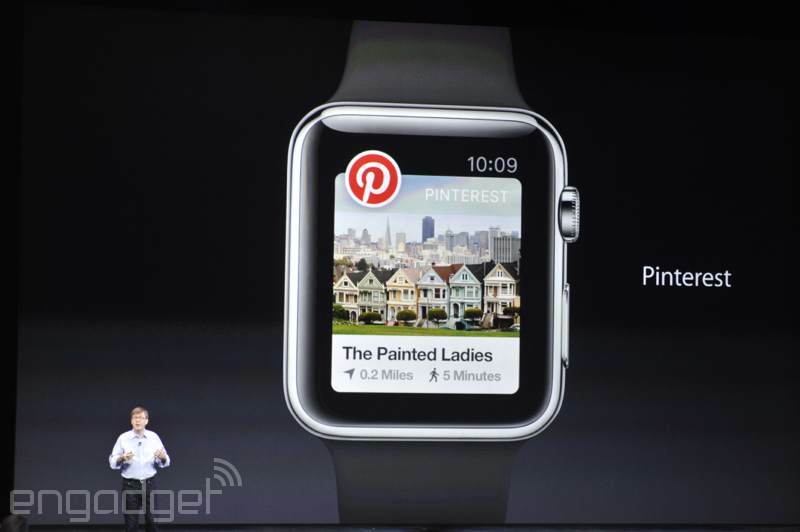 The Plus will come with double-paned landscape view. Nice mention of the leaks there, by Phil. 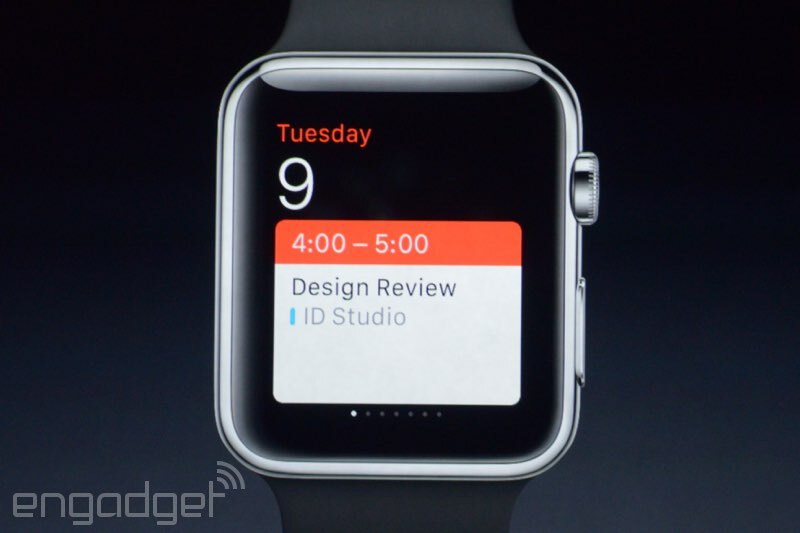 "In case you didn't already know," the screens are 4.7 and 5.5 inches. It's called Retina Display HD. sRGB-accurate, with ultrathin backlight, photo-aligned IPS liquid crystal, improved polarizer, ion-strengthened glass. 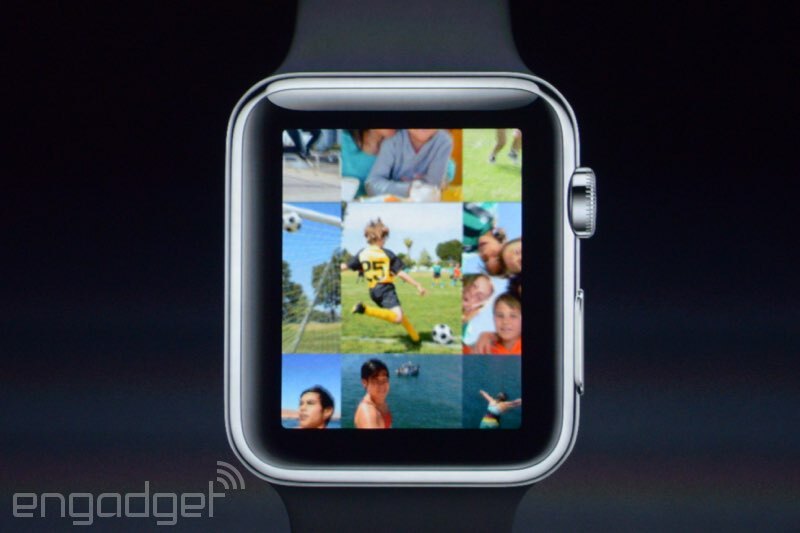 These are a next-gen Retina display. 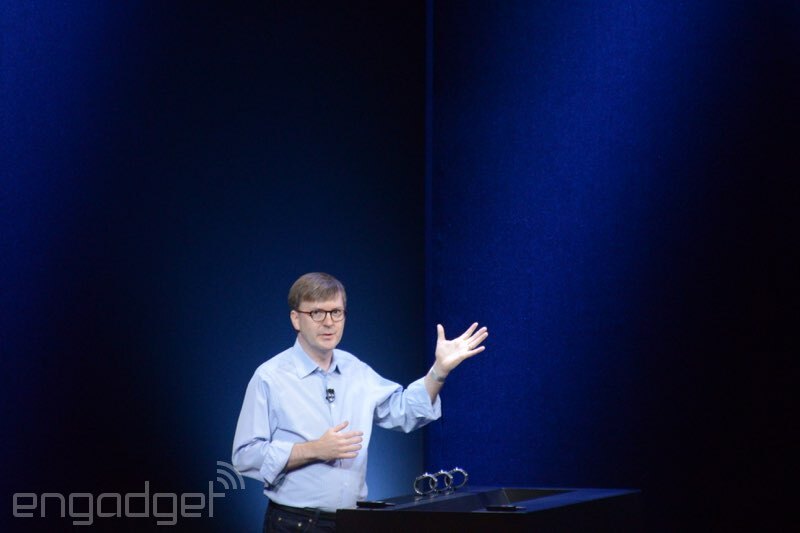 "I'm honored to be the one to tell you about the new iPhones. Their design is like nothing ever before. Incredibly unique. The glass front, the curves around the side, to meet seemlessly with the aluminum back." Michael GormanUnique? Not really. But beautiful? Definitely. 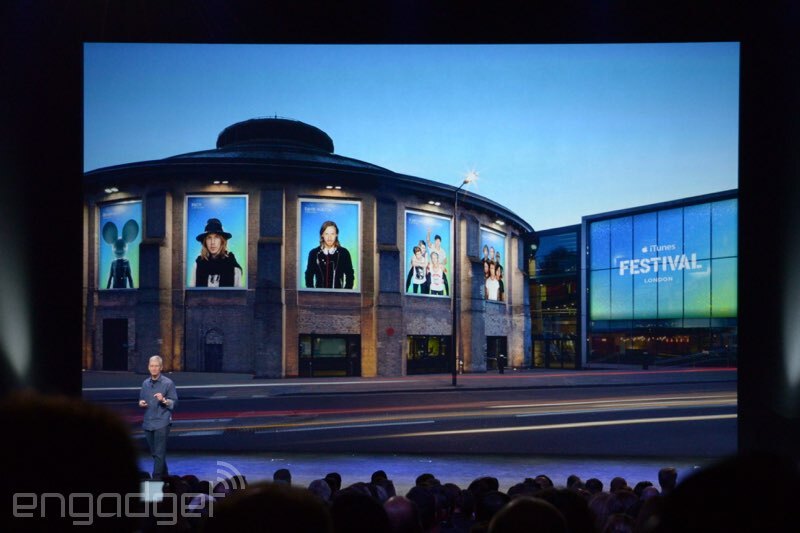 Phil Schiller is coming on stage now to tell us about them. "I hope you'll agree that they're the best phones you've ever seen. " 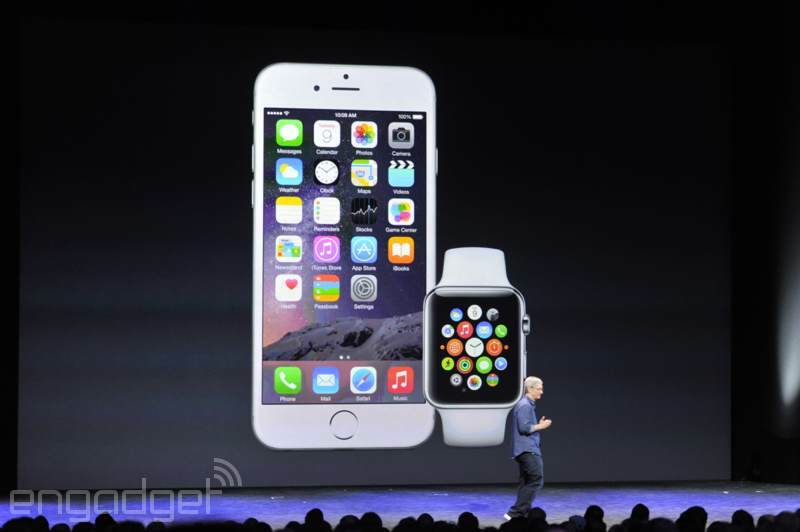 It's the iPhone 6 and the iPhone 6 Plus! Same home button at the bottom. Power button on the right side, volume rockers on the left. THE LEAKS WERE RIGHT, Y'ALL. Looking at the edge of the new iPhone. So far, it looks exactly like the leaked photos. Time to show them off! With a video. "The original iPhone set the bar for which the category would forever be defined. And for every iPhone that followed, we built upon the vision and pushed further and enlarged what the iPhone could be. " With 98 percent customer satisfaction. Michael GormanThat's a lot of satisfaction. Last year Apple announced two iPhones for the very first time. Tim's bragging that it's the number one smartphone in the world. 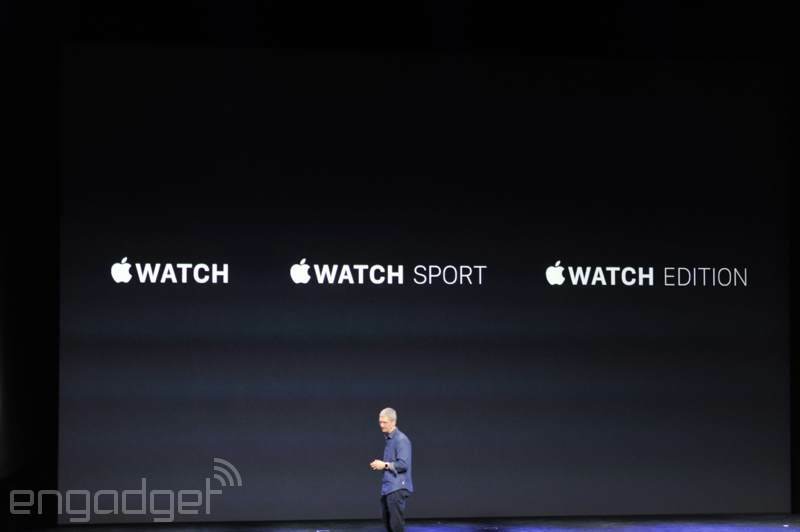 So first we're going to hear about iPhone. We'll be the judge of that, right folks? There's a lot to cover, apparently. Wow, Tim's not going to do the usual updates today! "Everything's great!" "Today, we have some amazing products to share with you. And we think at the end of the day, that you will agree that this too is a very key day for Apple." 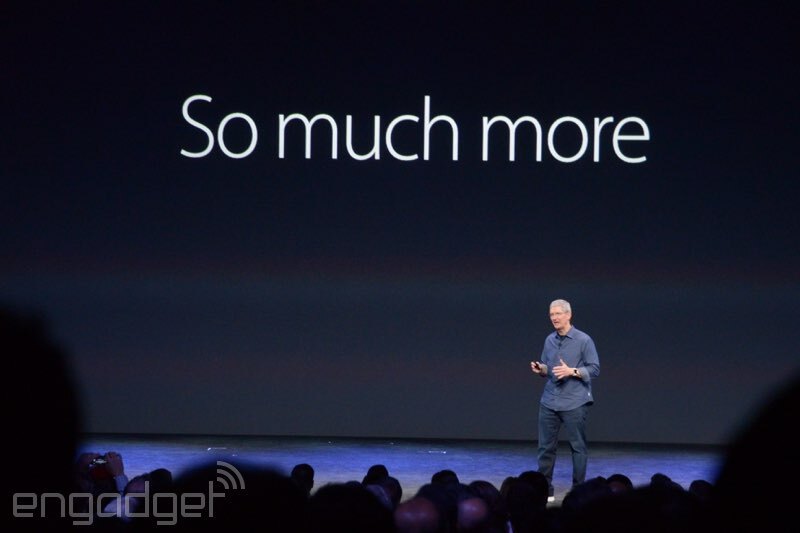 Tim's talking about 30 years ago, when Steve Jobs introduced the Macintosh to the world. And it's great to be here (for the first time, personally) with you. Tim. 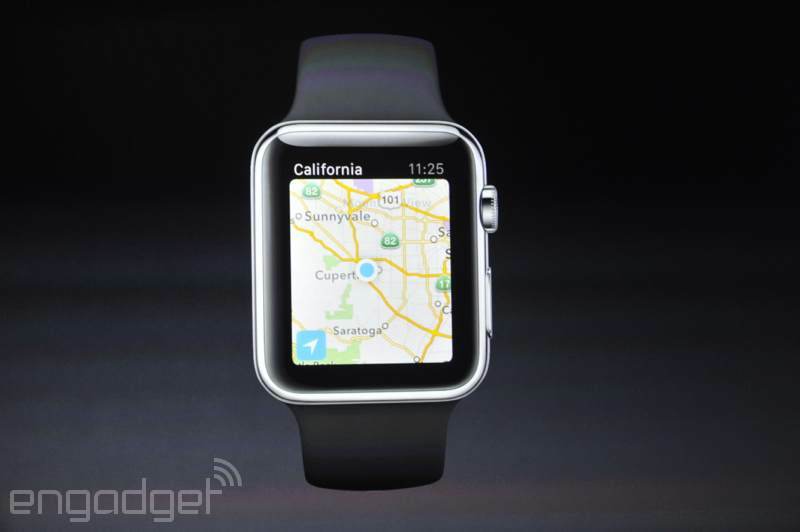 "As you know, we're just down the road from Apple's birthplace. We've had some amazing history here. 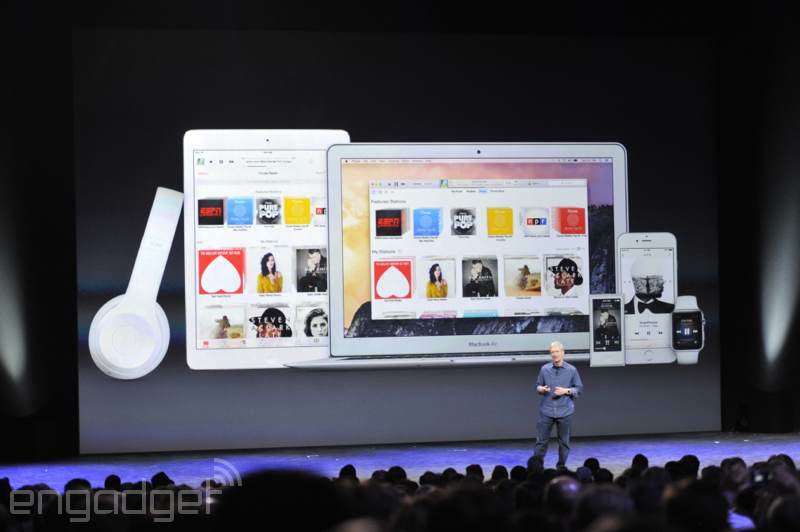 Some of the most important product intros in Apple's history on this stage." "It is great to be back in the Flint Center." "Welcome! Those words mean a great deal to us. We hope they mean something to you." All sorts of optical illusions being used in the video thanks to perspective shifts and creative shooting. 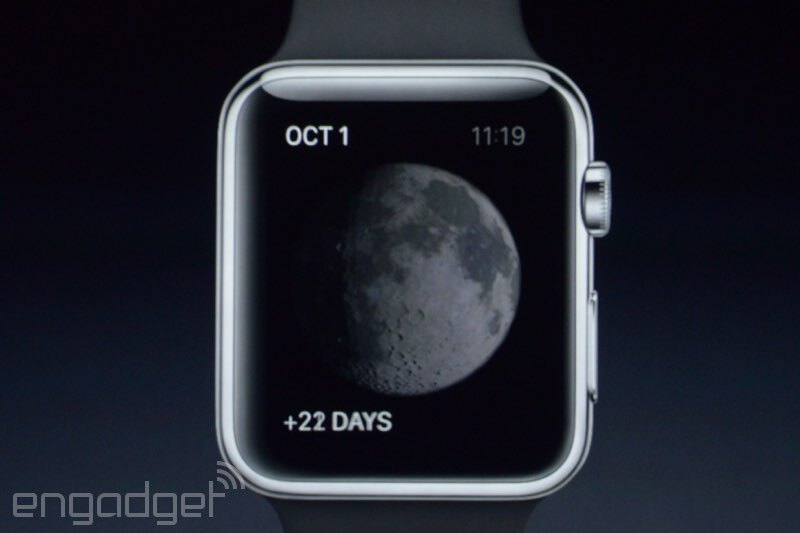 Nifty stuff, Apple. 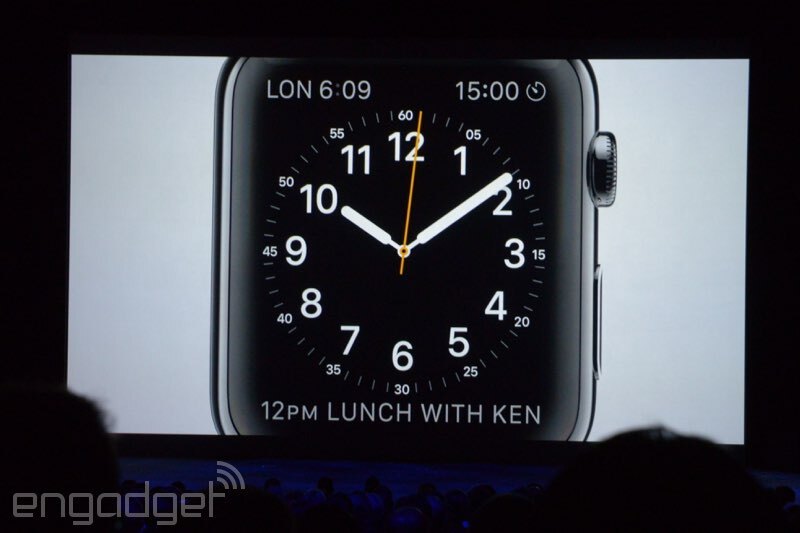 And Tim Cook is on stage. Thundering applause! Another way. A bigger way. One that lifts up humanity, breaks down barriers and heals the landscape. It's talking about relentless optimism, change, doing things differently. I sense a theme. Aaaaaand, here we go! Lights dimmed, and we're watching a promo video. Folks are still filing in, but we should be getting started here soon. What do y'all think we'll see? Get at me @Numeson and Brad @phonewisdom on Twitter. I and Brad will be tickling the keys this morning, whilst Mr. Honig will be hitting you with the images you crave. Greetings, people of the internet! 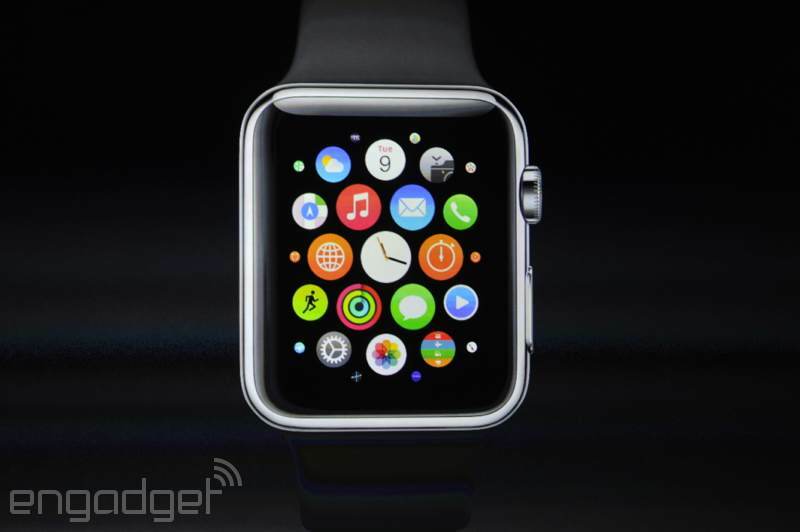 It's iPhone (and iWatch?) day, and I, Michael Gorman, alongside Brad Molen and Zach Honig will be bringing you all the action today. September is a month synonymous with the beginning of autumn, but it's also become associated with something else entirely: The iPhone. Today, we're in attendance at the Flint Center in Cupertino to hear about the latest products and updates from Apple, and we're expecting at least four new devices (two iPhones and two wearables). Join us at this space beginning at 1pm ET on September 9th, because we'll be liveblogging the event and bringing you the latest updates as it happens. Should be a long and intense event, so make sure you bookmark this page and come back for it all!